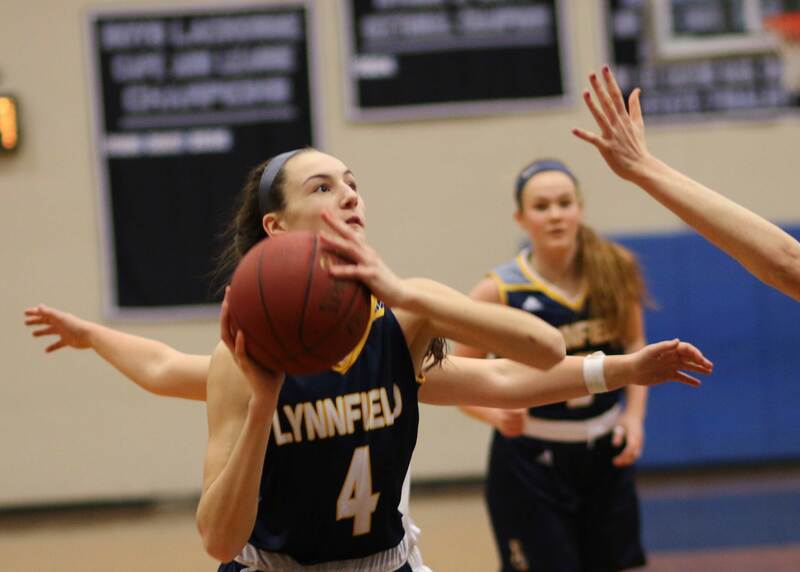 (Byfield MA) Friday night was a special night for the Lynnfield Pioneers girls basketball team. 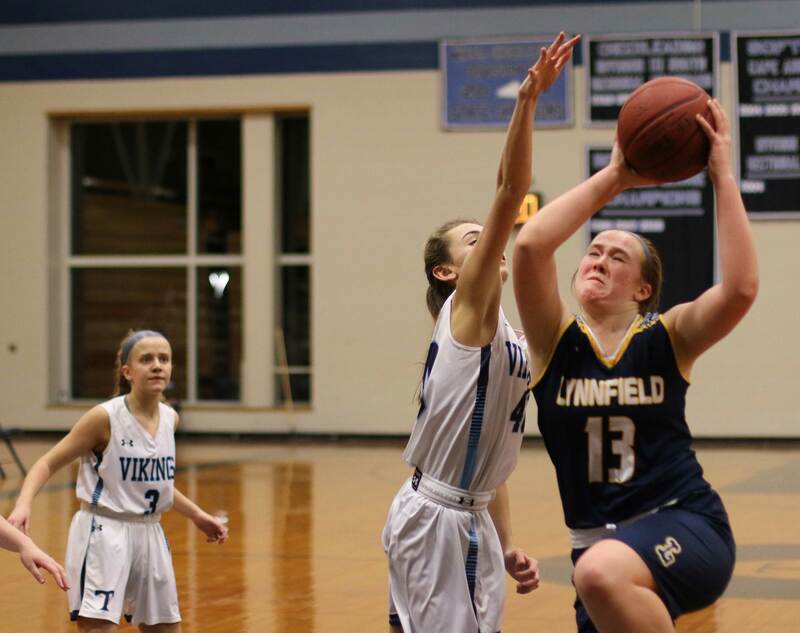 Lynnfield defeated Triton, 47-18, and qualified for the post-season. Extra special because the Pioneers (10-8) were 5-52 over the past three seasons and lost their coach (Jim Perry) in April. 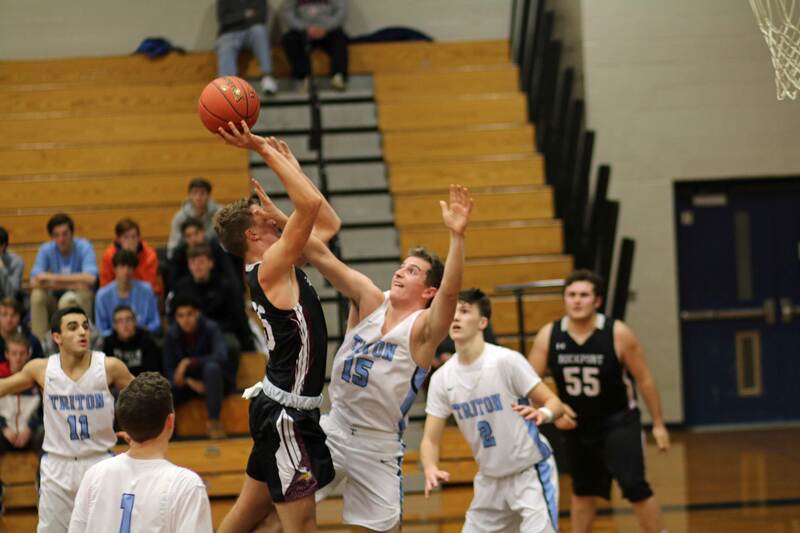 The visitors came out in a zone and defended Triton into a night full of turnovers and missed shots. 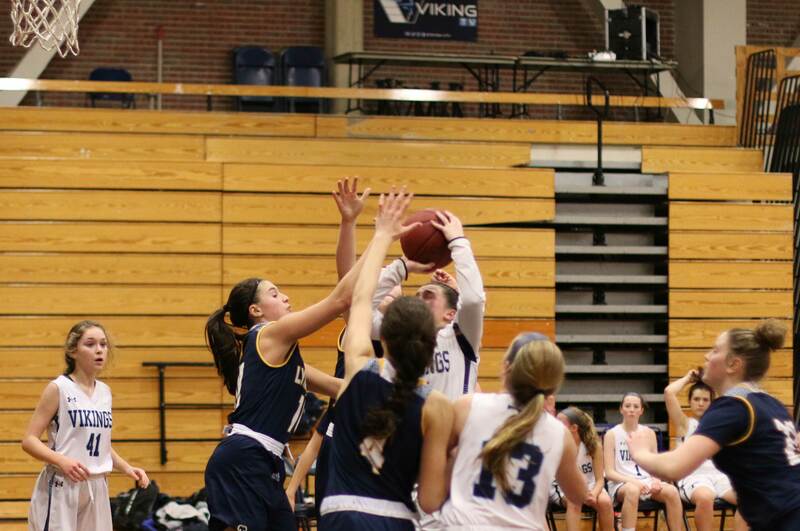 “We’ve been working hard on defense,” said Tori Morelli (15 points). 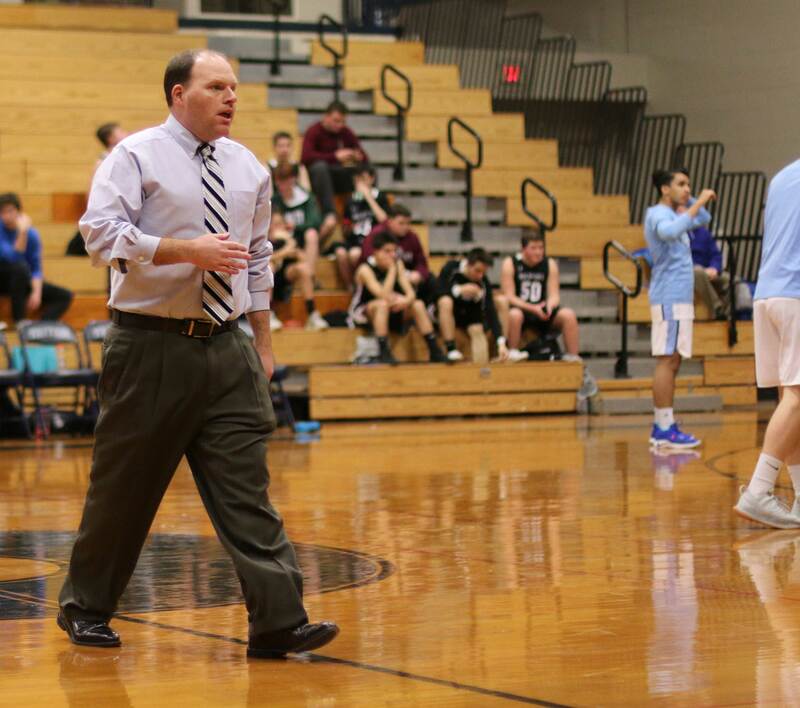 “Our zone defense has stifled a lot of people because we’re pretty long and athletic,” said Coach Bocchino. 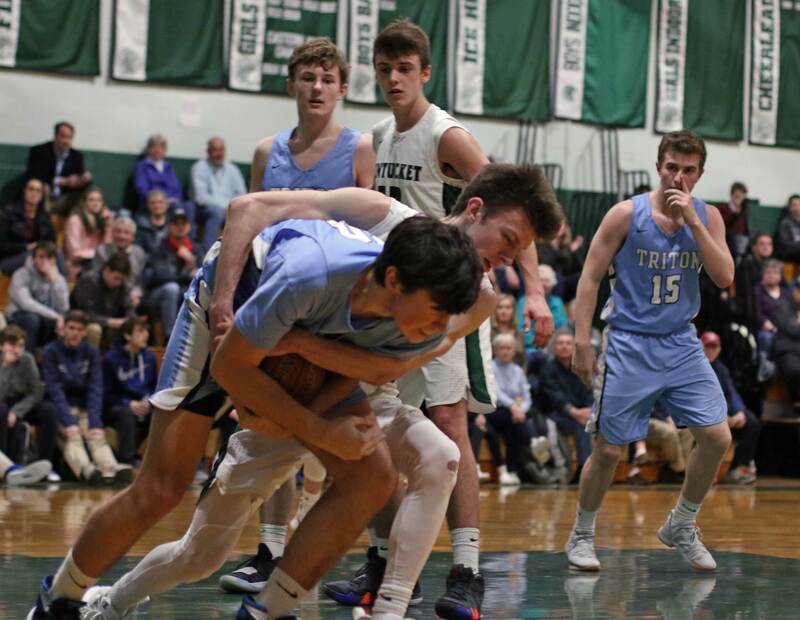 The Pioneers had their share of struggles with turnovers (22) but, unlike Triton, they put points on the board regularly. The direction of this game was set in the first quarter. 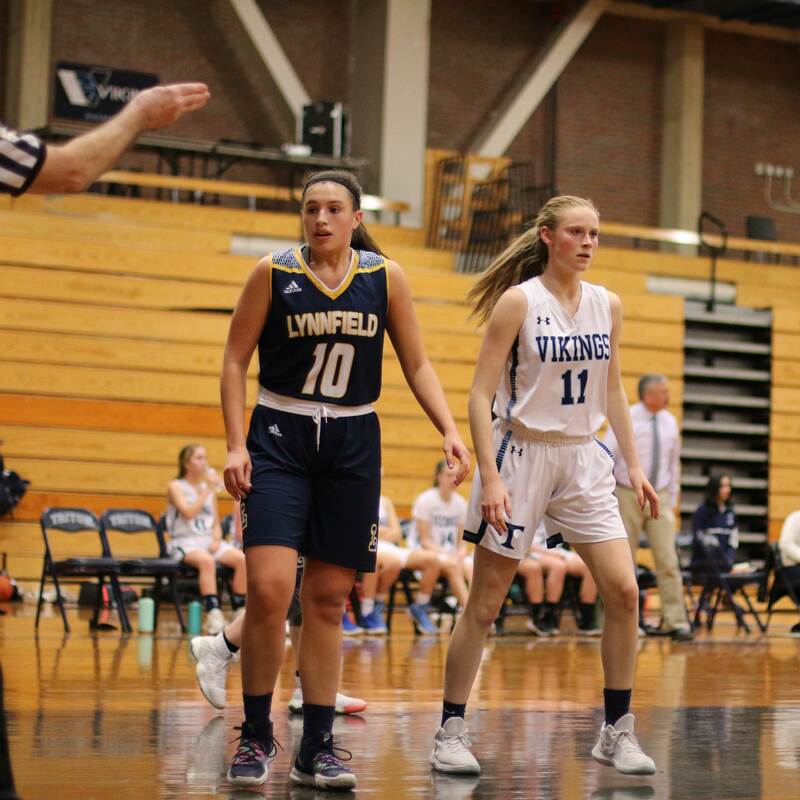 The Pioneers put eleven unanswered points together while the Vikings put twelve turnovers together. 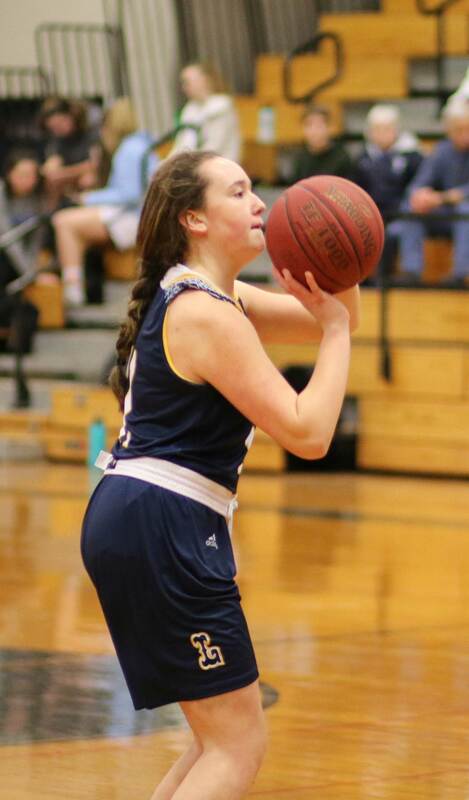 Triton’s only points (two Caitlin White free throws) of the quarter came with fourteen seconds left. 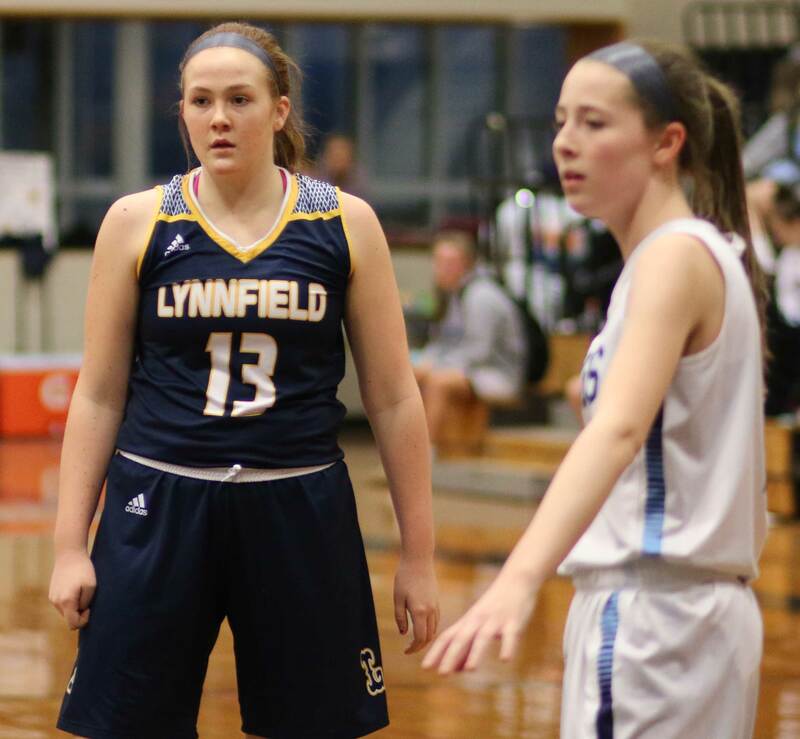 Lynnfield 11, Triton 2. 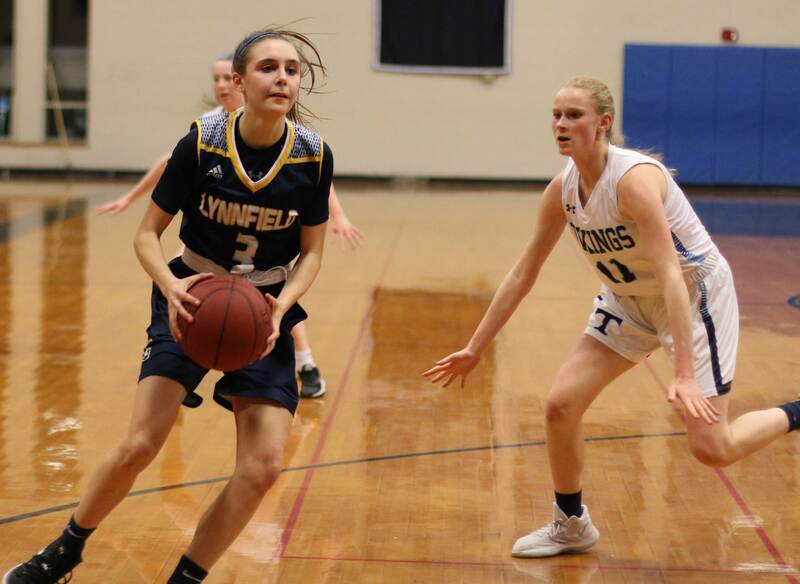 Sophomore Ava Buonfiglio (11 points) had two three’s for LHS in their fast start. 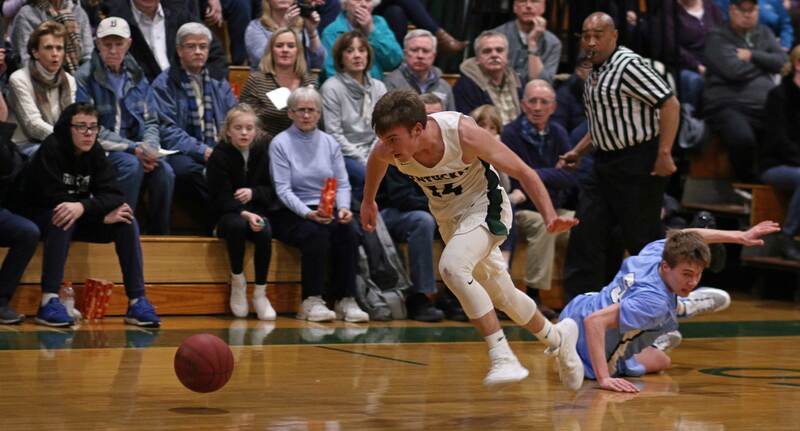 The Vikings lessened their miscues thereafter, but they didn’t get their 11th point until there were only three minutes left in the game. 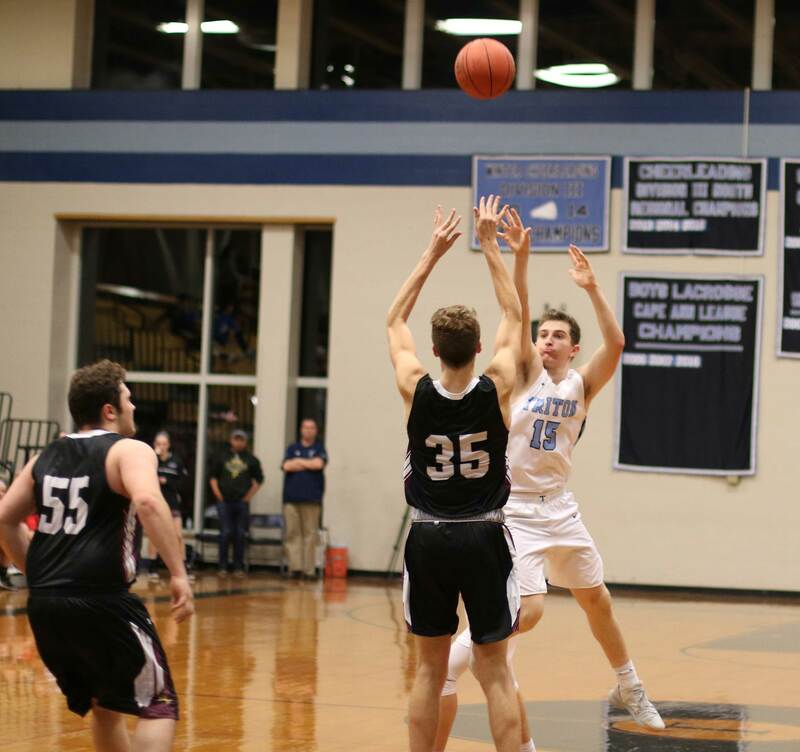 The Pioneers put nine straight together at the end of the 2nd quarter, into the 3rd quarter, and a 17-6 lead bulged to 26-6. 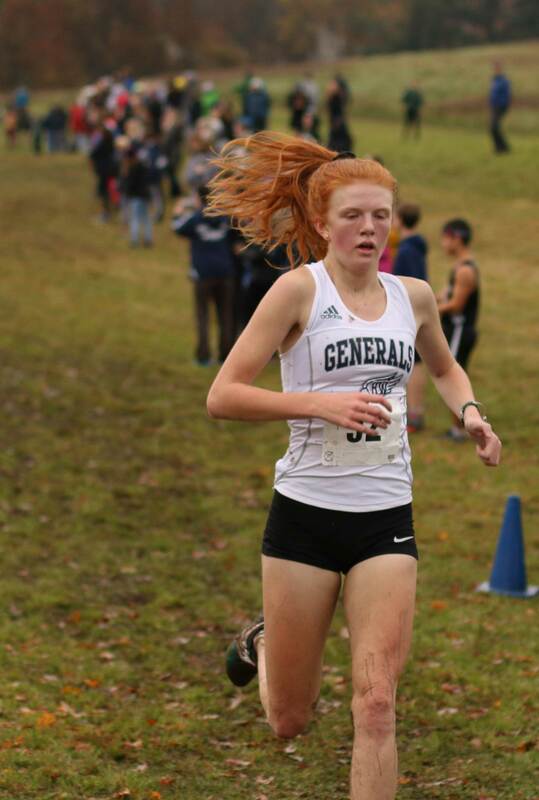 Ava, Riley Hallahan, Tori Morelli, and Catherine MacDonald contributed points. 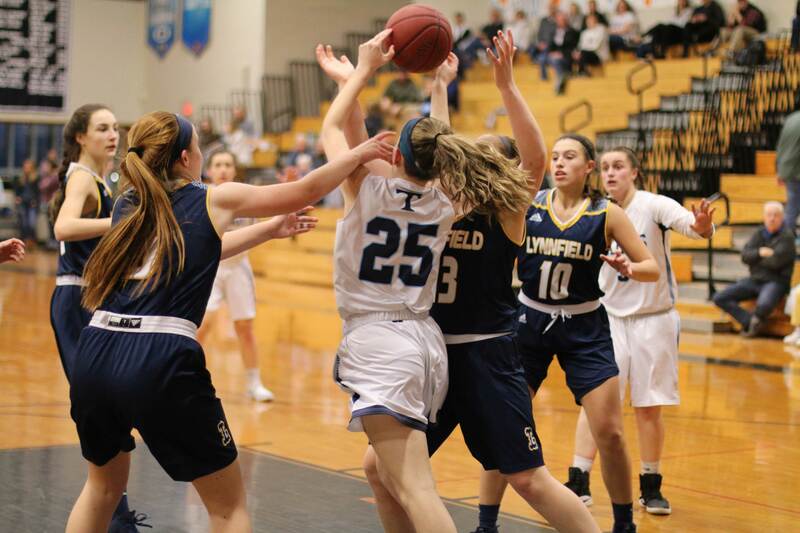 Lynnfield collected fourteen in a row in the second half and a 26-10 spread became 40-10 in the final quarter. 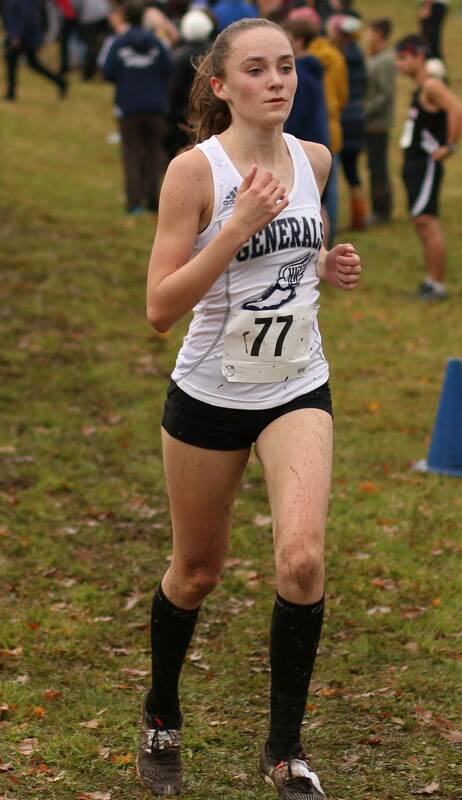 Melissa Morelli totaled six of the fourteen points. 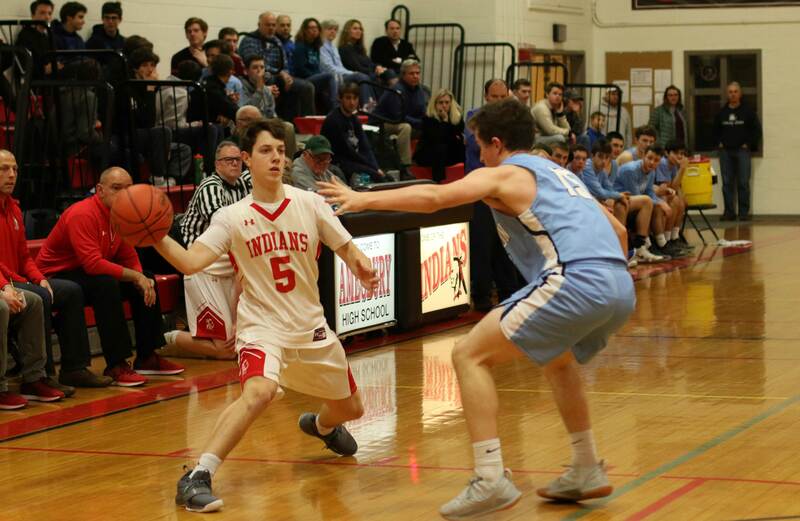 “Some role players stepped up, Ava (Buonfiglio) had big three’s and Riley (Hallahan) was killing the boards,” said Coach Bocchino. 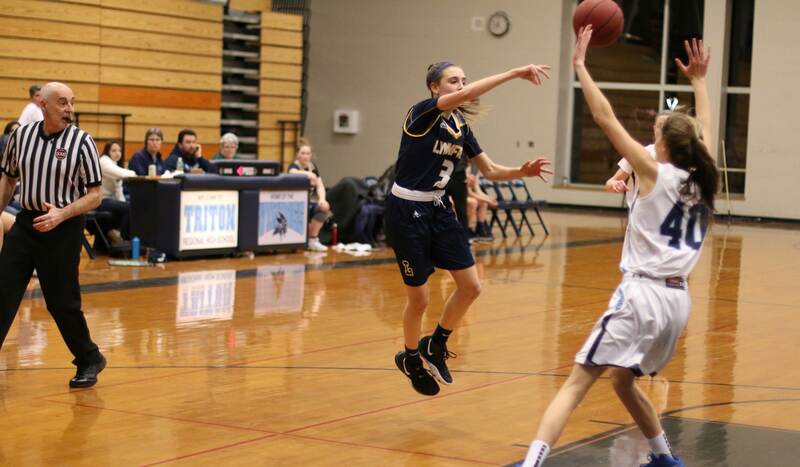 Seniors Colleen McCarthy and Emily Karvielis each had six points for Triton. Neither team shot “lights out,” but the lights did go completely out with a few minutes remaining. 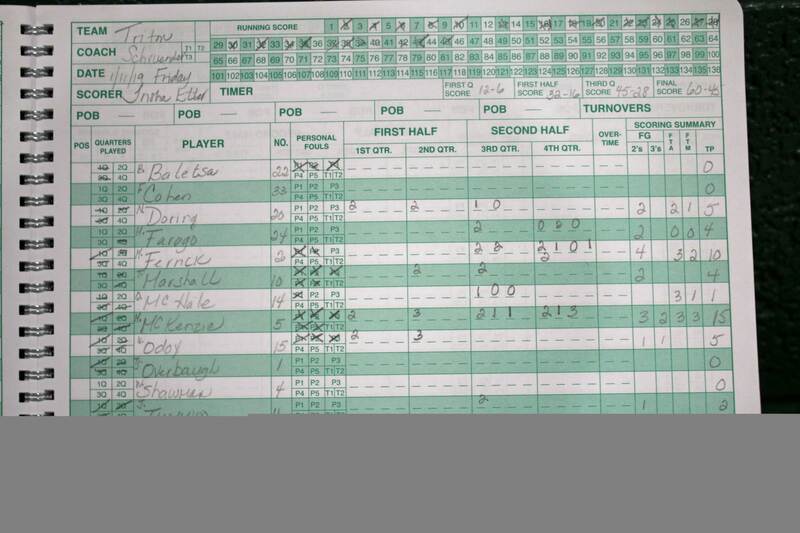 Both teams shot better after the lights came back……..I’m not sure what to make of that! (West Newbury MA) The wait for the first loss continues. 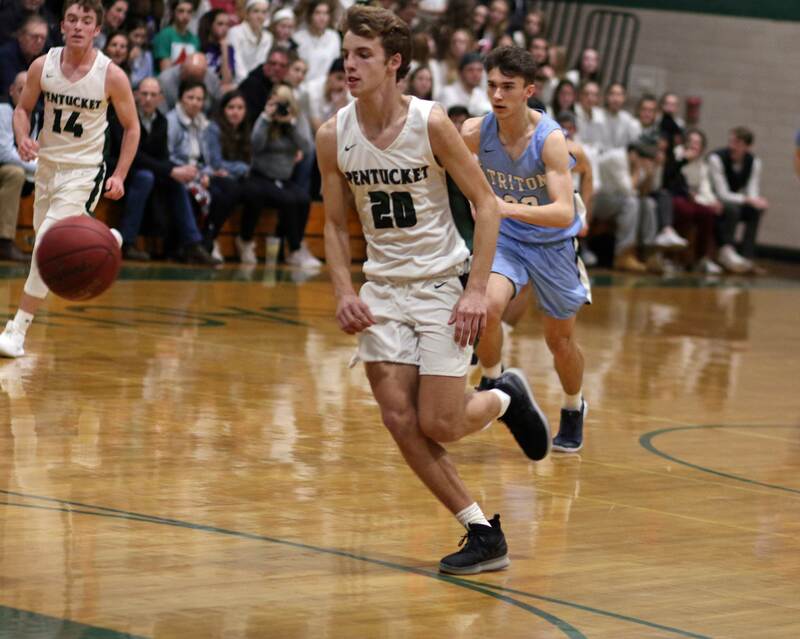 Pentucket (9-0) had a big first half and continued with their winning ways defeating Triton, 60-45, on Friday night in Cape Ann League action. 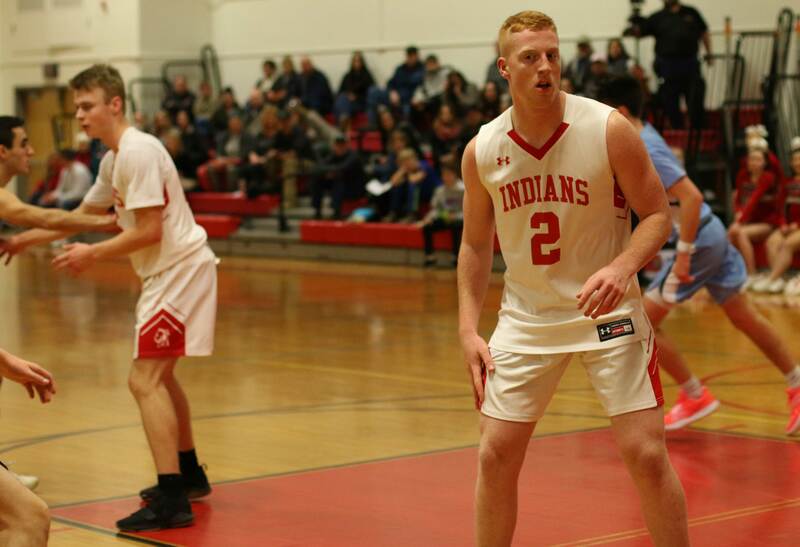 The Sachems are one of only two Division 3 North teams to still carry an unblemished record. The other is St. Mary’s (Lynn). 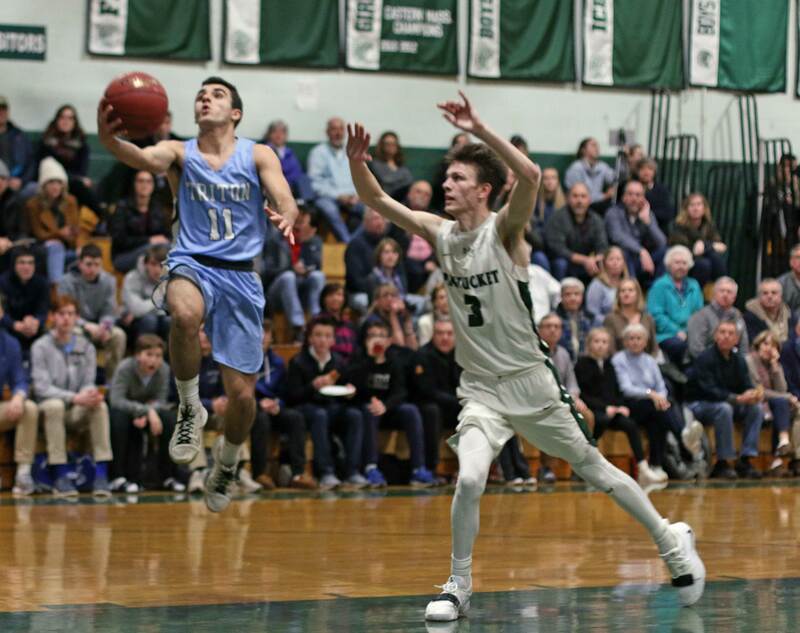 “We’ve had good team play at both ends of the court,” was how Pentucket coach Ed Hickey explained the Sachems terrific start. I saw what he was talking about tonight against the Vikings. 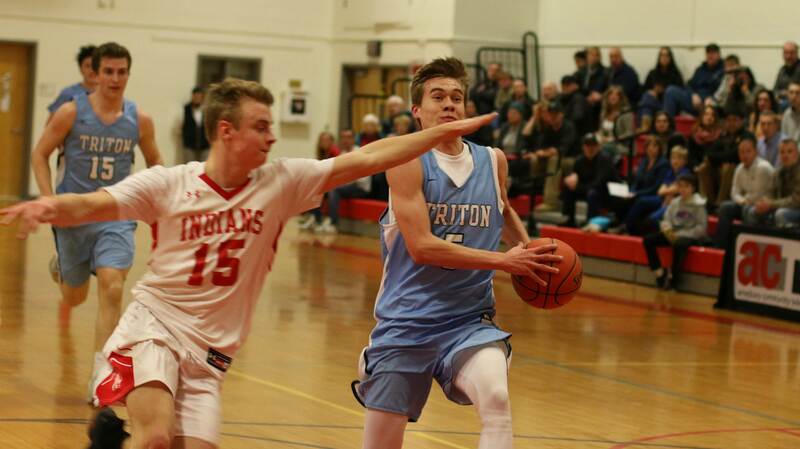 The Sachems played an active zone that gave Triton few open looks, especially in close. 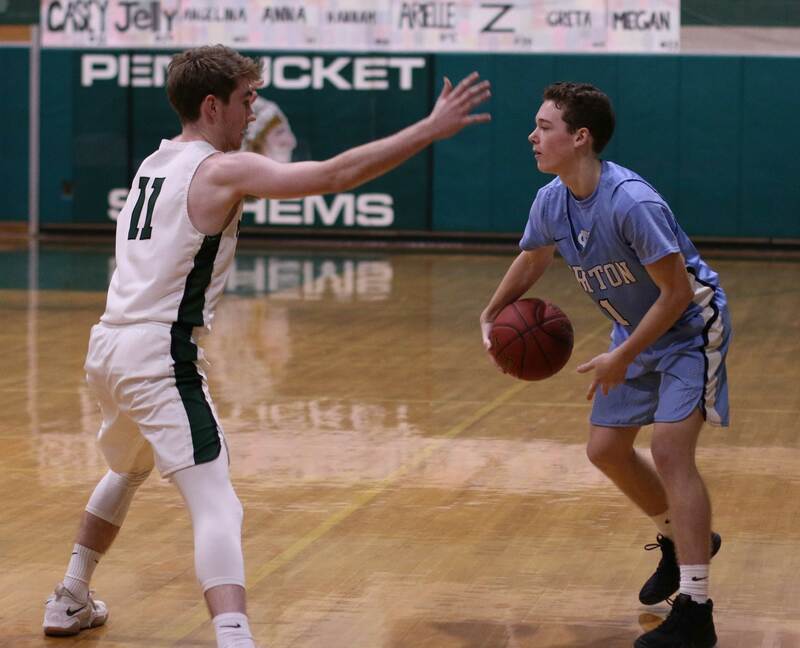 On the other end, against the Triton zone, Pentucket was patient and willing to pass the ball until a good shot showed up. Call them unselfish. 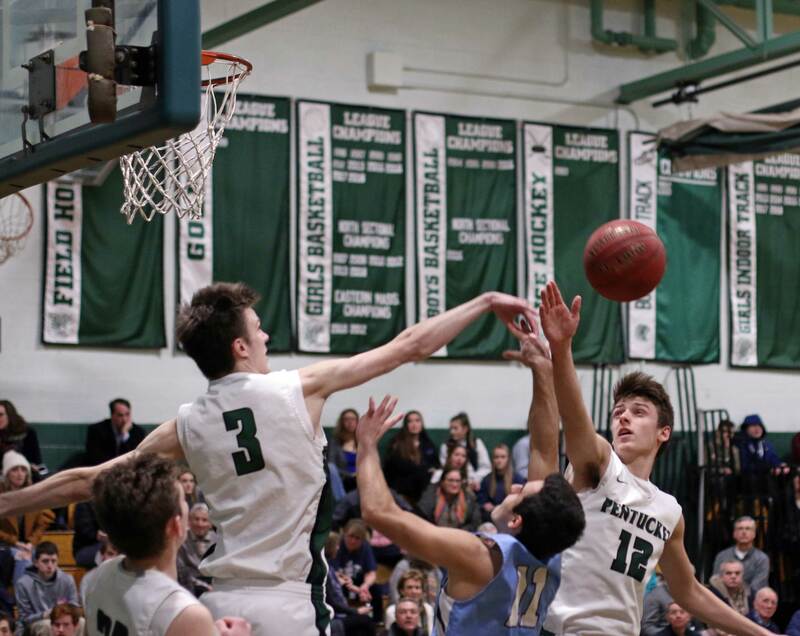 Junior Jake Etter led Pentucket with seventeen points, collecting thirteen of them in the breakaway first half. 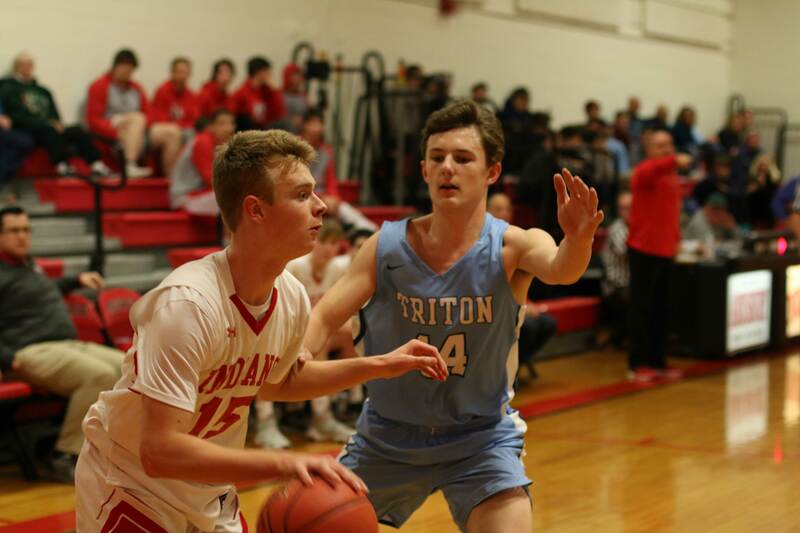 Senior Spencer Pacy had 16 points including four straight free throws in the 4th quarter when Triton had cut their deficit inside of double digits. 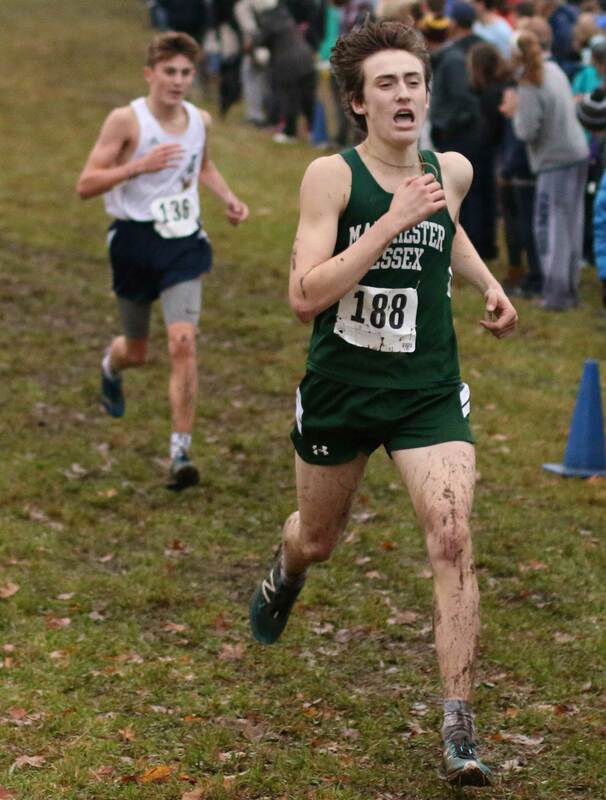 The Sachems have been winning by large margins so far this season. “We needed a competitive game because we will be in those kinds of games in the future,” explained Gus. The Vikings (5-5) were looking at a 50-30 deficit 1 ½ minutes into the final quarter. 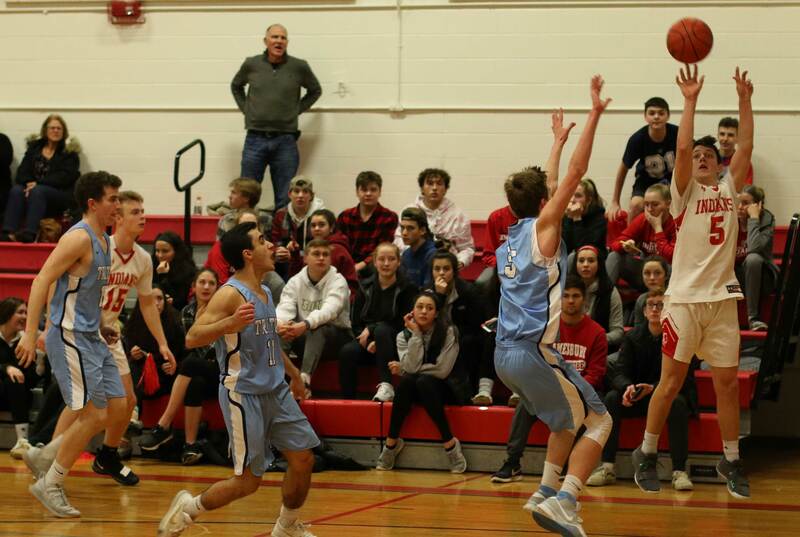 But then, sparked by junior Michael Farago, the visitors put good defense and point-producing offense together and made things interesting. 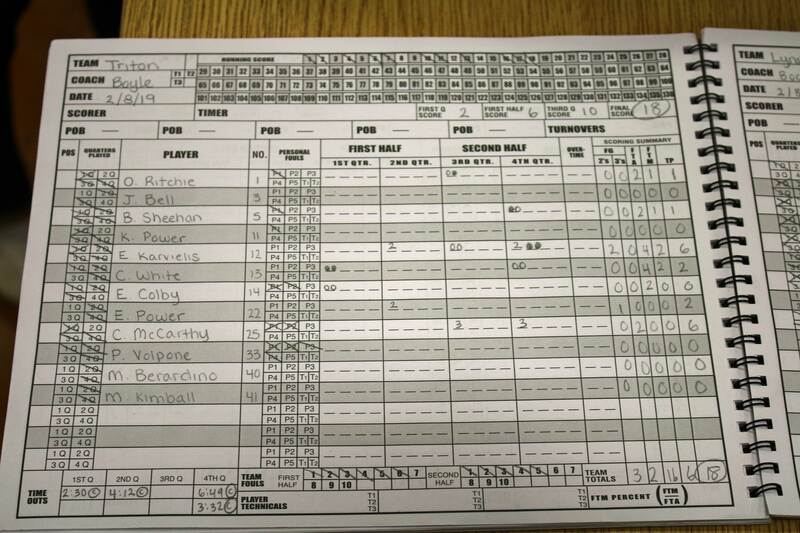 The result was a 12-1 run tightening things to 51-42 with 3 ½ minutes left. Pentucket coach Ed Hickey saw where things were headed and called a timeout. Out of that timeout it was the home team’s turn to shine at both ends of the court. 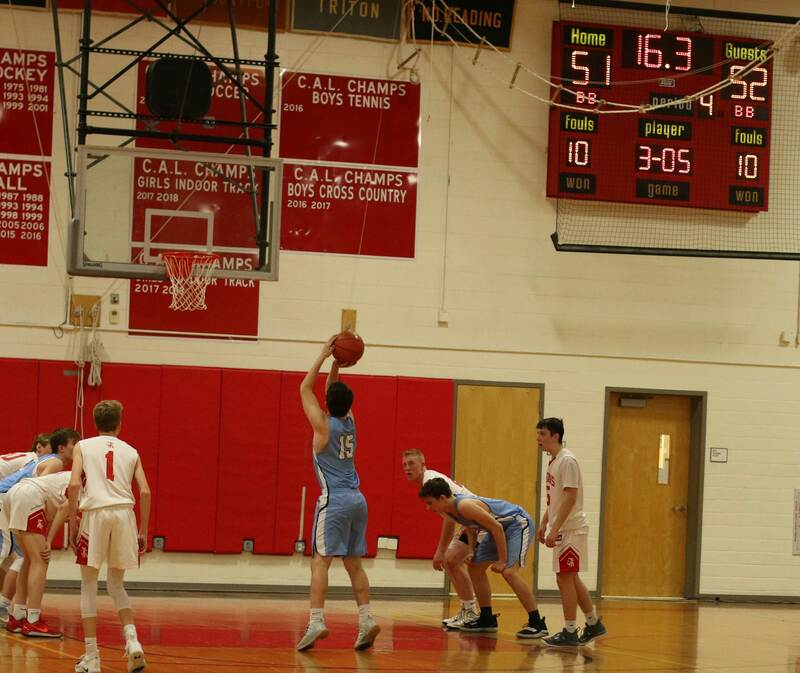 In the next minute the Sachems regained control of the direction of the game and pushed on to their 9th win. 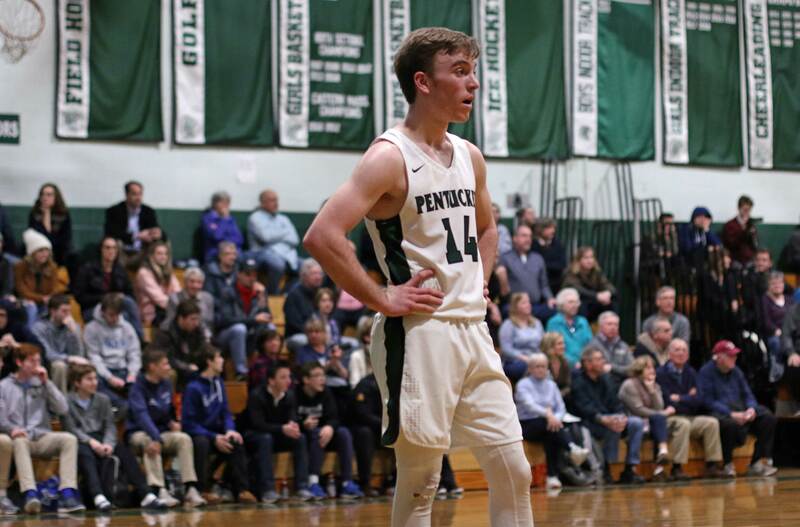 Spencer Pacy (four free throws), Peter Cleary (two free throws), and Gus Flaherty (layup assisted by Sam Stys) were involved in Pentucket’s good minute of offense/defense. 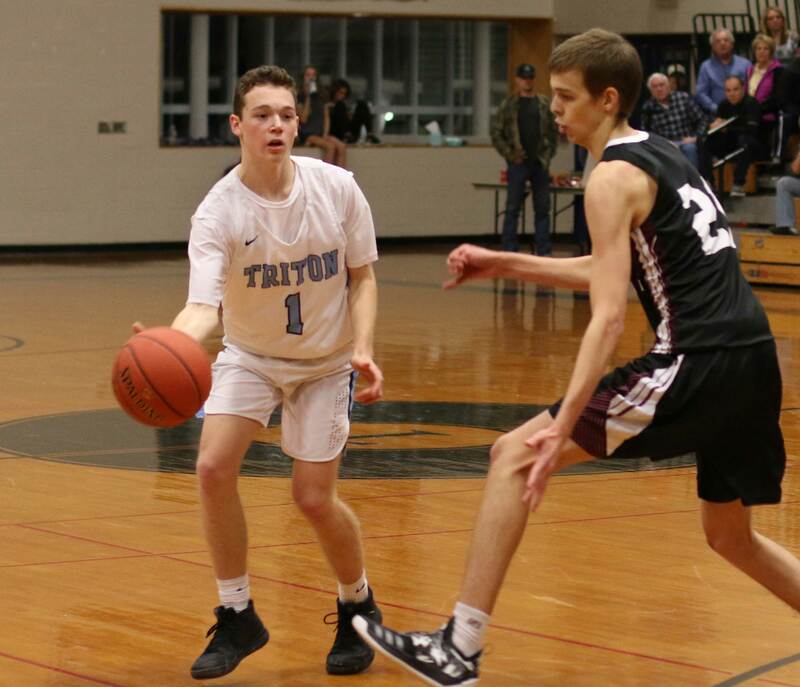 Max McKenzie (15 points) paced Triton. 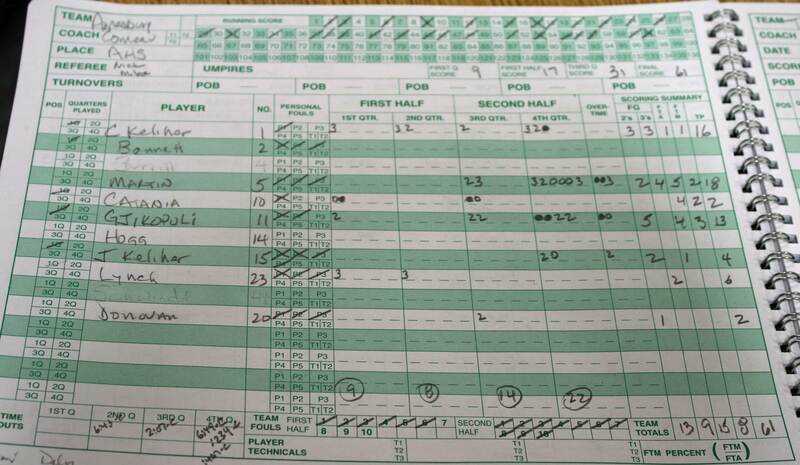 Max lost quite of few minutes because of foul trouble. 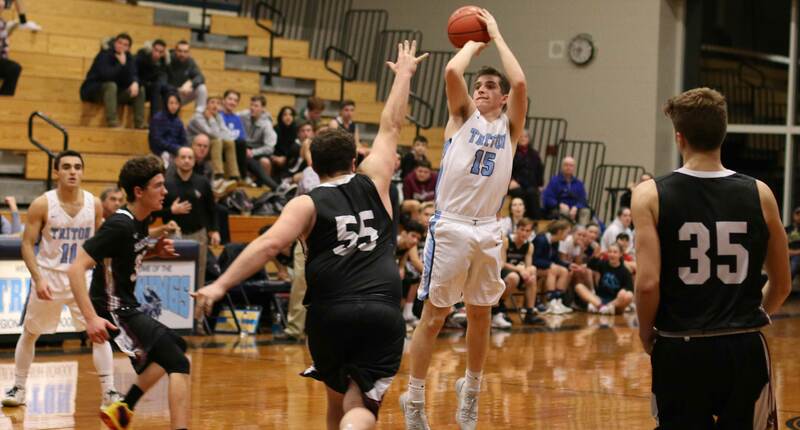 Mason Ferrick tallied ten points for the Vikings getting all of them in the second half. 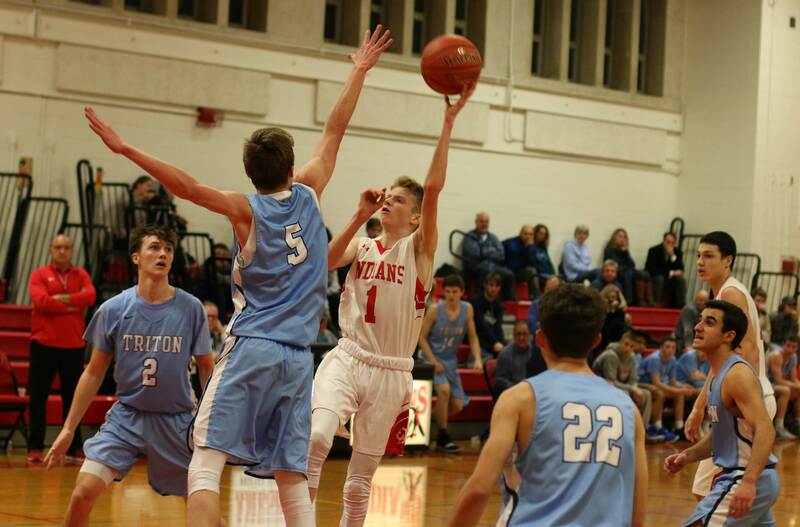 The Sachems broke a 9-6 game open with a 14-2 segment that stretched into the second quarter. Jake Etter had a big part in the breakaway notching eight points. 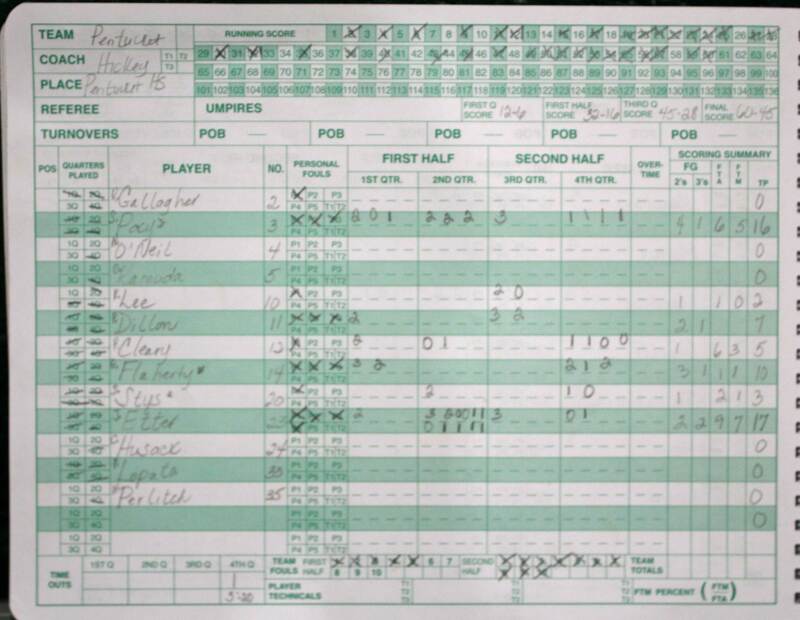 He had a triple and added three straight free throws when he was fouled on an attempted three. Triton trailed by sixteen (32-16) at the half. The deficit climbed to twenty (50-30) in the final quarter before they cut the lead to nine. Triton struggled to make shots most of the night, but their defense turned up scoring chances in the last period. 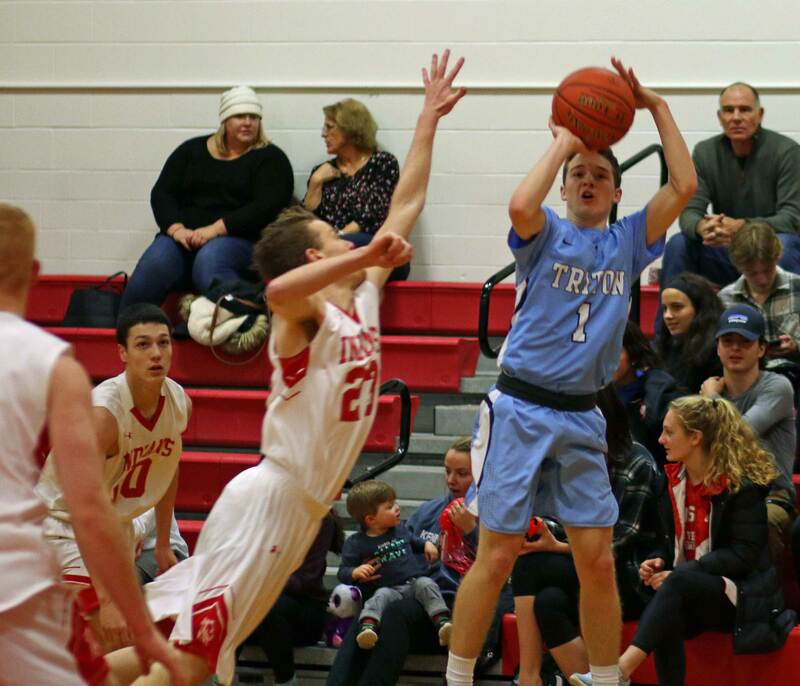 Triton actually “won” the second half (29-28) but their sixteen-point halftime deficit was too much to overcome. 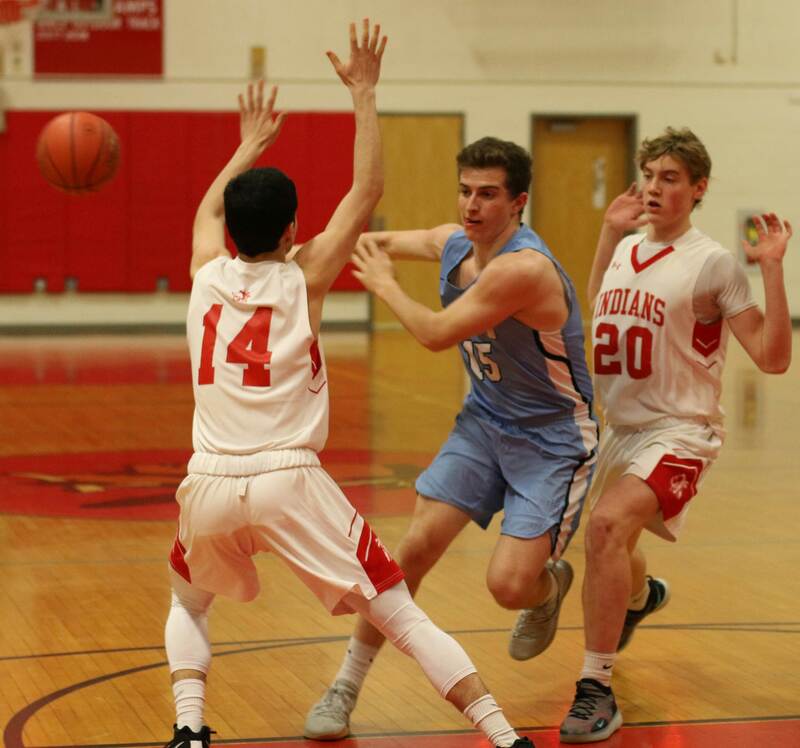 The Sachems will face two Division 3 Cape Ann League teams with only one loss over the next ten days; Hamilton-Wenham and Newburyport. 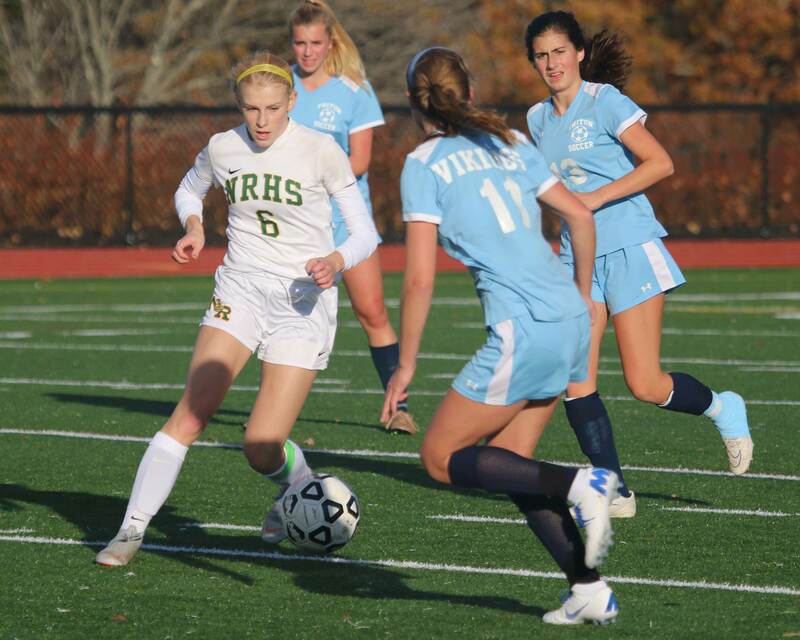 “Both teams have been strong over the last couple of years,” said Coach Hickey. 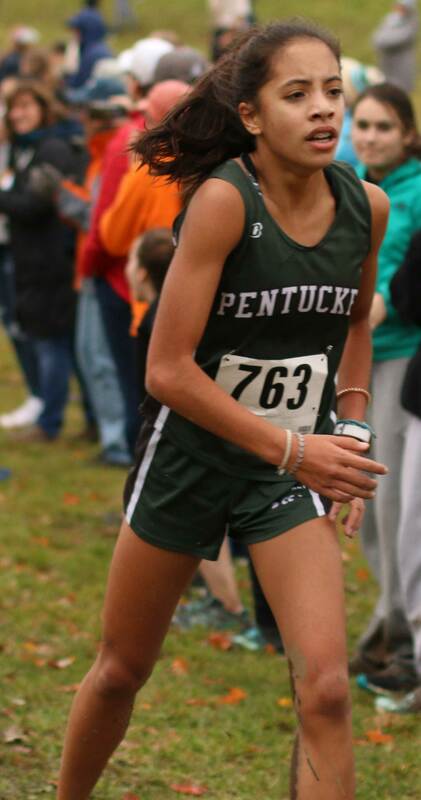 Pentucket was 16-7 last season. They reached the state semifinals at the end of the 2014-15 season. 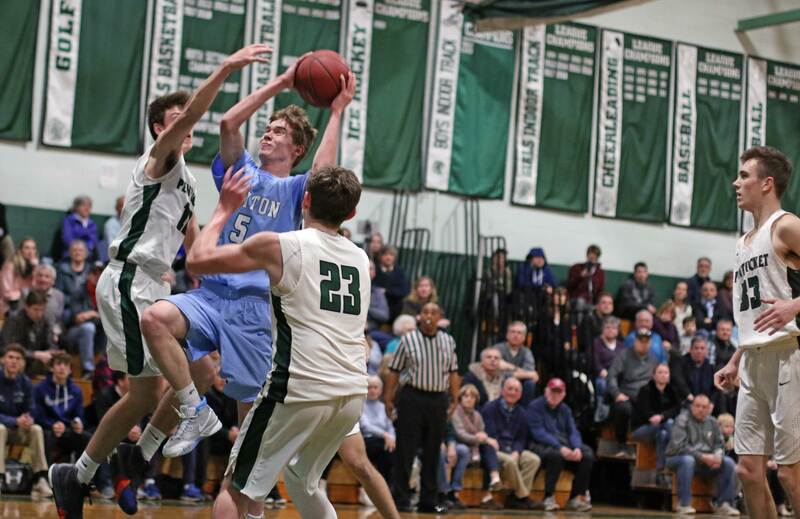 There will be a rematch between Triton and Pentucket at Triton on February 1st. Good teams have multiple scoring threats. 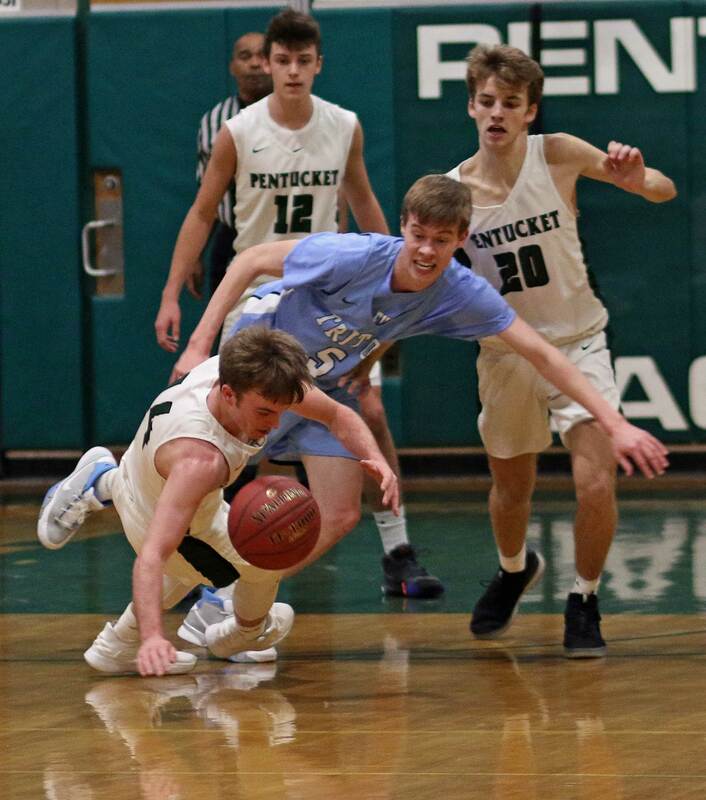 Pentucket fits that bill having had five different players (Jake Etter, Pat Dillon, Spencer Pacy, Peter Lopata, Gus Flaherty) be top scorers in their nine wins. (Byfield MA) You hear it all the time, but how often does it mean anything? 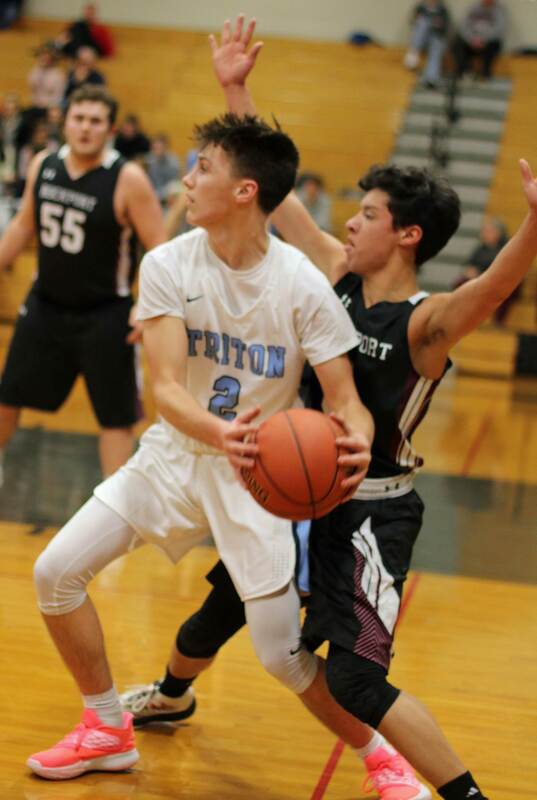 Triton’s Kyle Odoy (16 points) dropped that line into our post-game interview tonight after his team rallied late in regulation and then went on to defeat Rockport, 54-51 in overtime. Triton (5-2) certainly needed a miracle finish to get this one into overtime and they pulled it off. 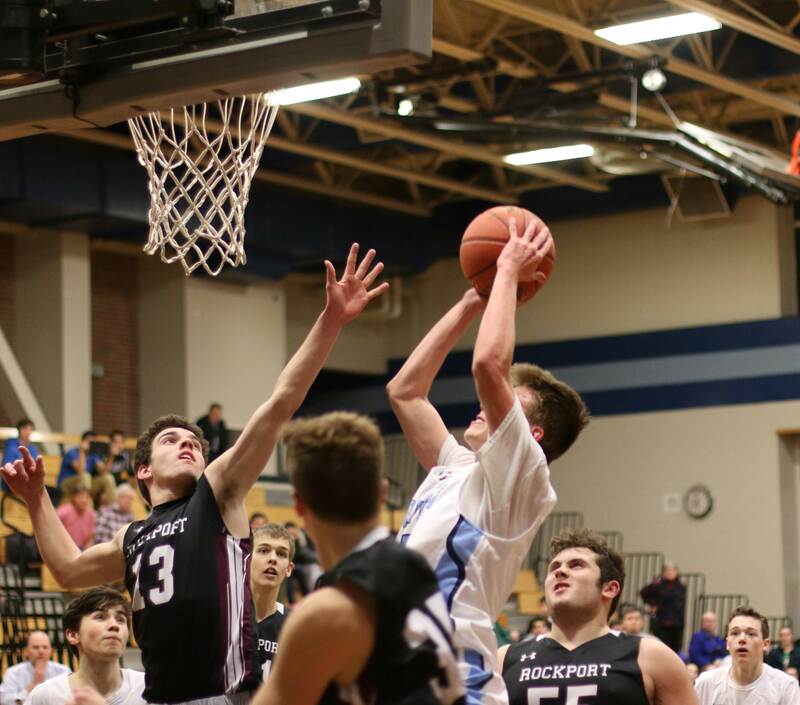 Three straight free throws by Jake Knowlton (14 points) put Rockport (2-6) up, 48-43, with only twenty-three seconds left in regulation. 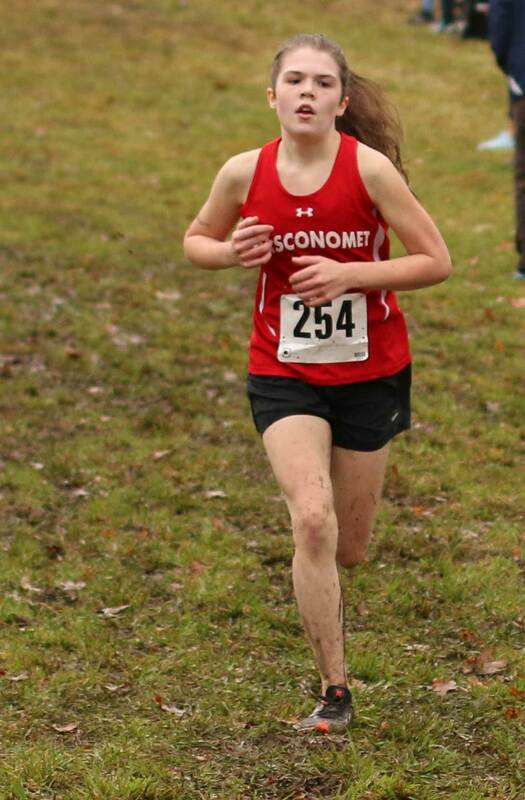 Comfortable lead…….or so it seemed. 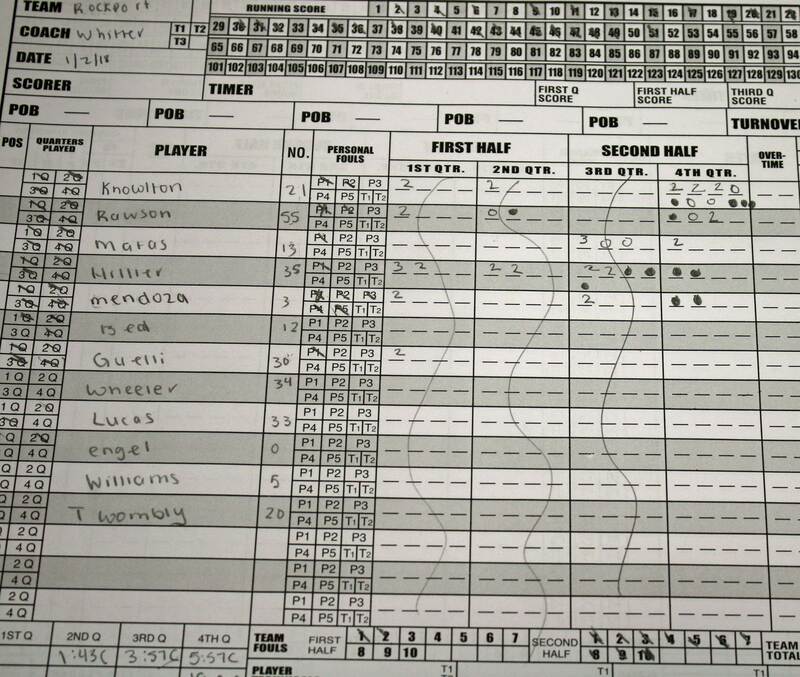 And fall they did as Kyle Odoy drained two straight from long range in the closing 23 seconds. 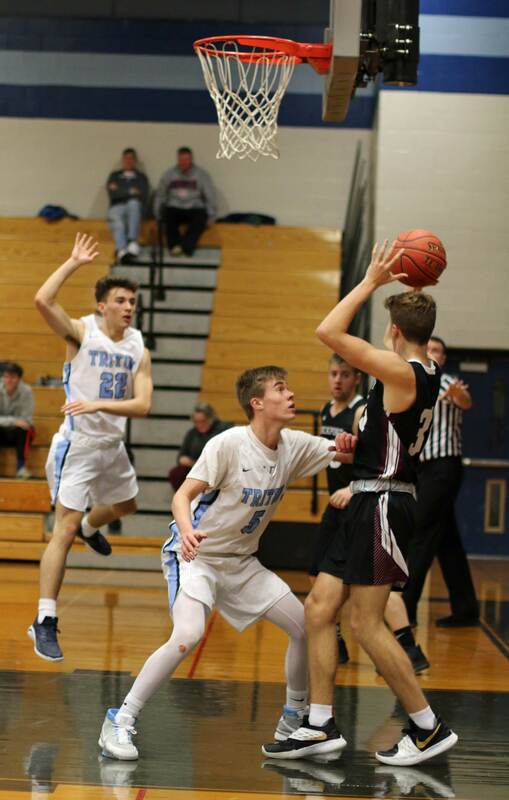 The first last-minute triple was on an inbounds play from in front of the Triton bench with eleven seconds remaining. The second was of the “Hail Mary” variety from straight away. 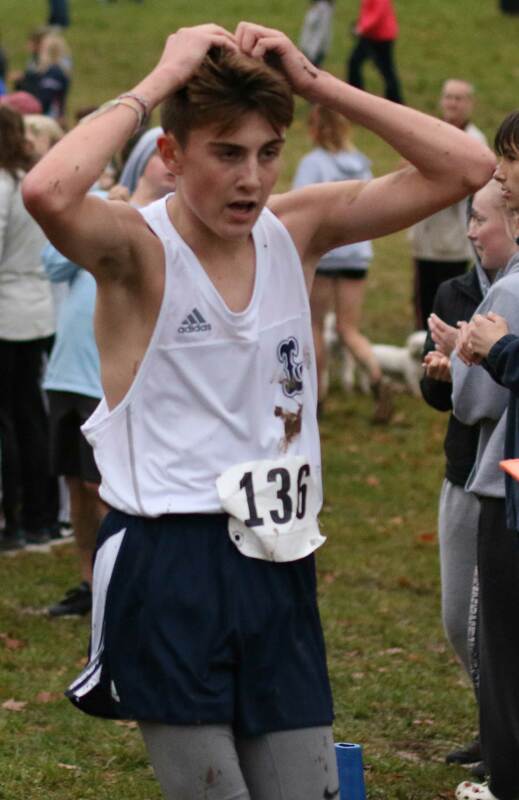 “I just got it and chucked it,” said Kyle describing the buzzer-beating second one. 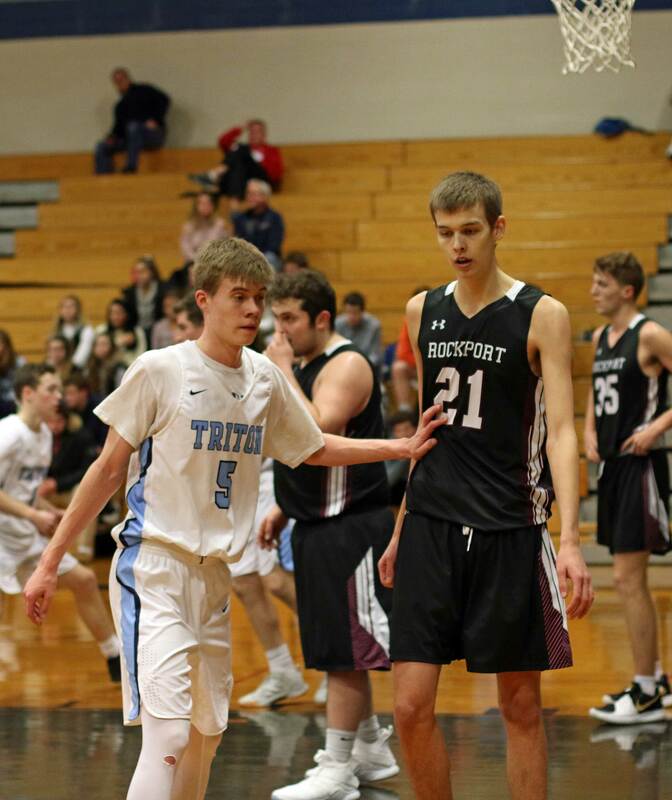 In between the two Kyle triples, Noah Rawson (10 points) made one of two free throws for Rockport. Noah missed the second and there was a tie-up. The possession arrow favored Triton and gave them time to come down for the final shot. “Not much,” would be the answer! 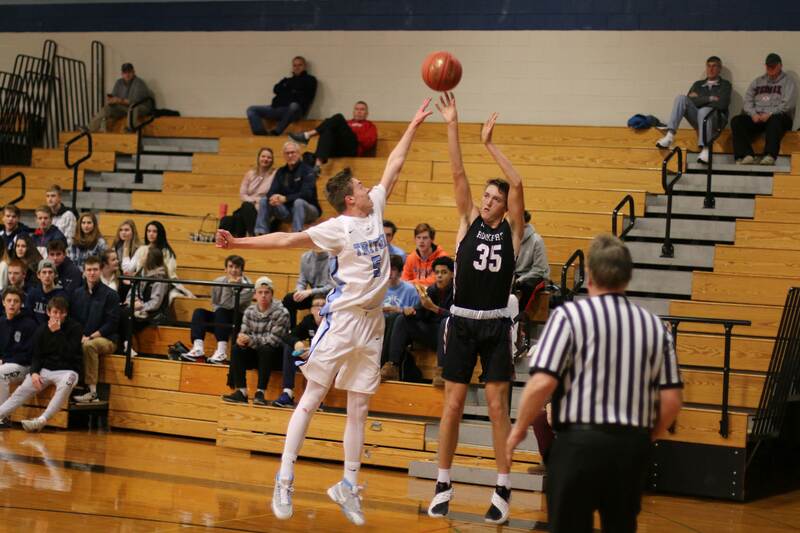 Noah Rawson tied the game (51-51) with a layup halfway through OT. 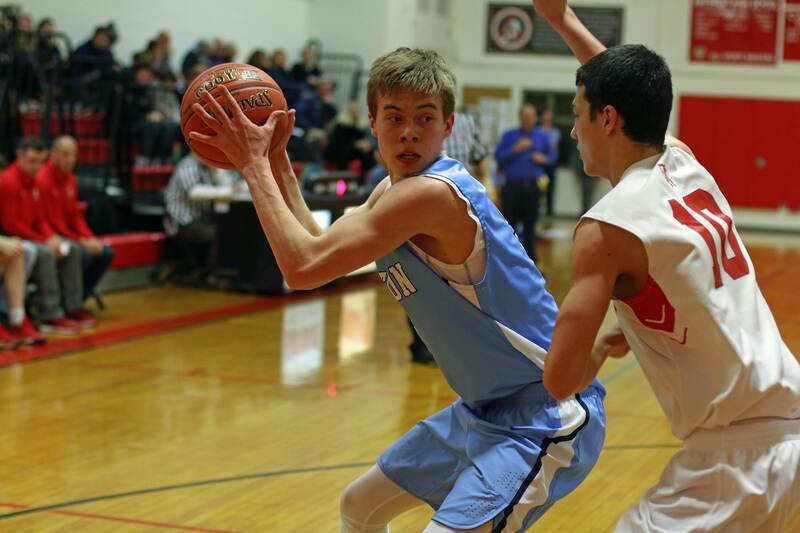 Kyle Odoy then put Triton in front for good with 1:45 left on a jump shot. 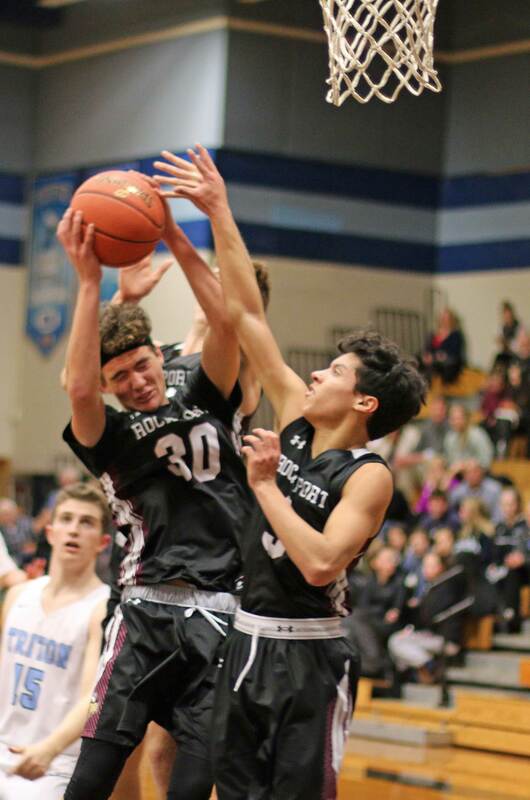 After that the Triton man-to-man defense kept Rockport away from the basket. The visitors didn’t turn the ball over, they just couldn’t get their outside shots to fall. 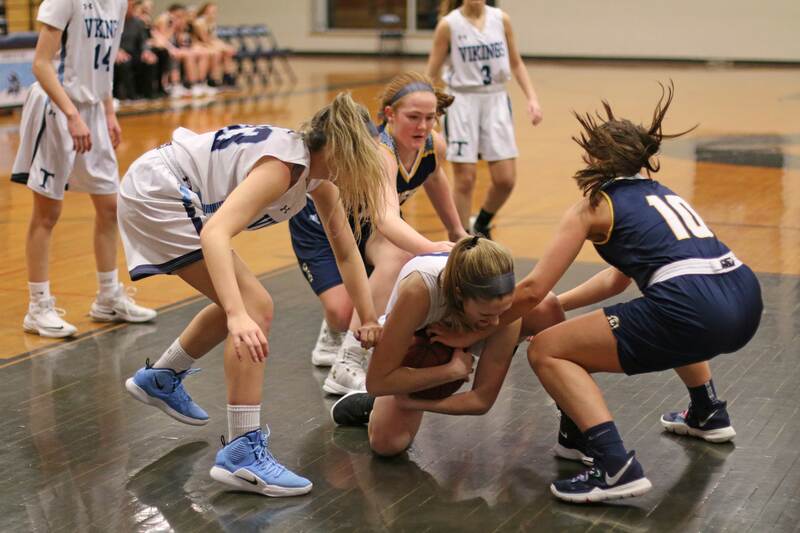 On the other end, Triton took the ball to the basket and forced fouls. 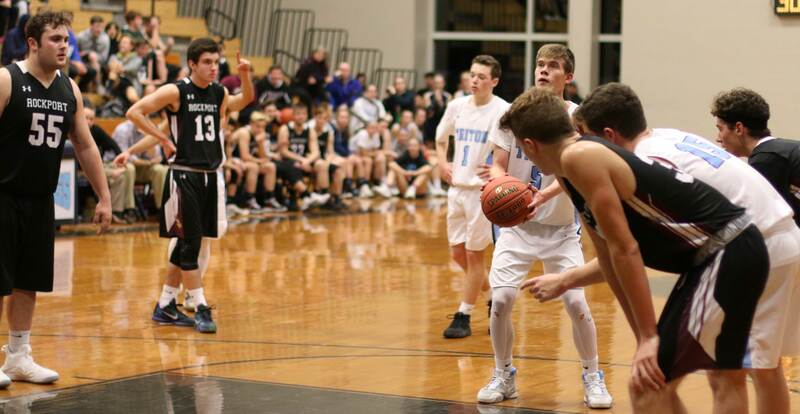 That “it’s not over ‘til it’s over” thing was still in play because Triton missed four of five free-throw attempts. 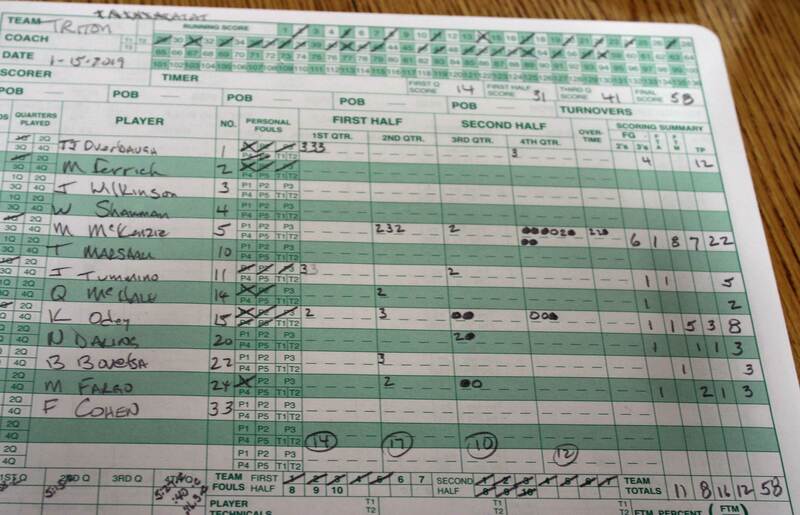 Rockport had three possessions to catch up but not on this night. 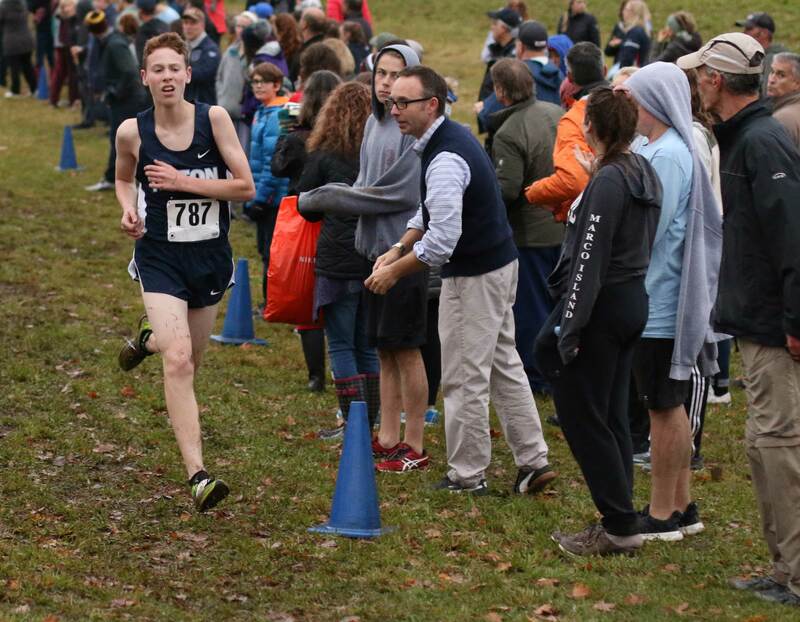 “We had just enough to win,” said Coach Schruender. Tonight’s game was tied ten different times. 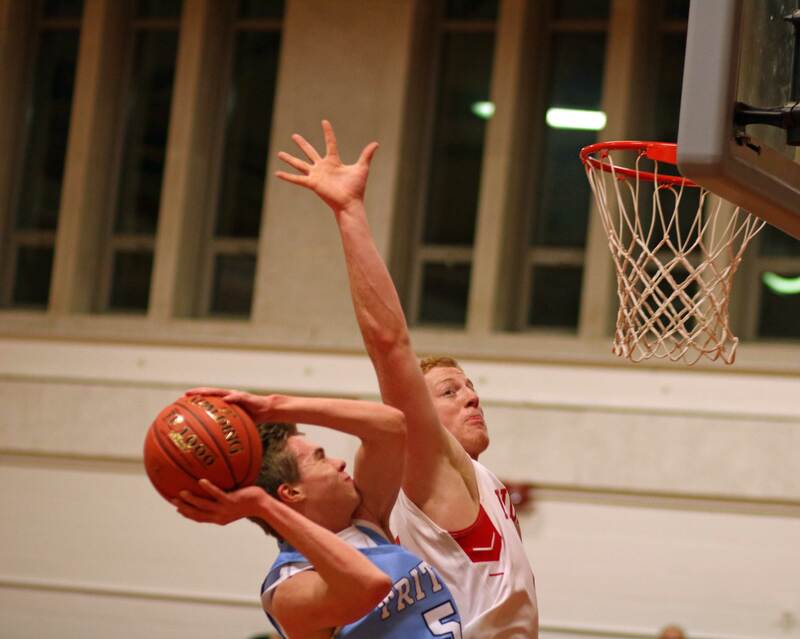 TJ Overbaugh (8 points) hit a three in the closing seconds of the first period. 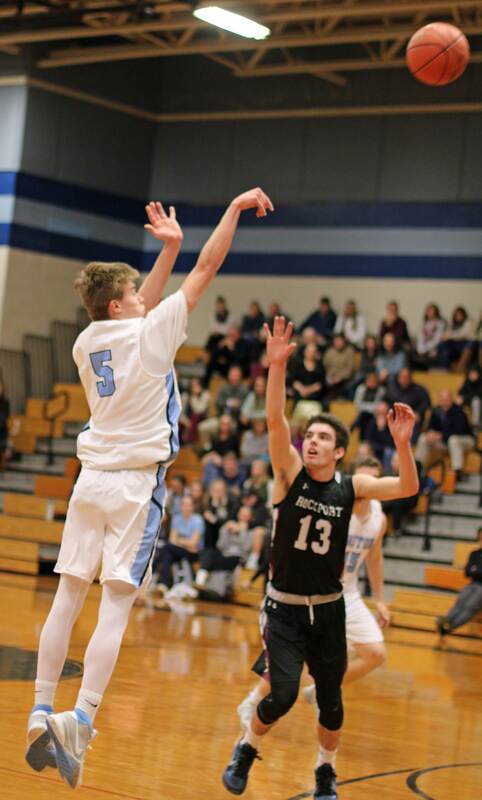 Max McKenzie (16 points) drove the length of the court to end the third period with a layup. I guess we should have expected that something could happen at the end of regulation! Triton had a 28-20 lead a minute into the third quarter. 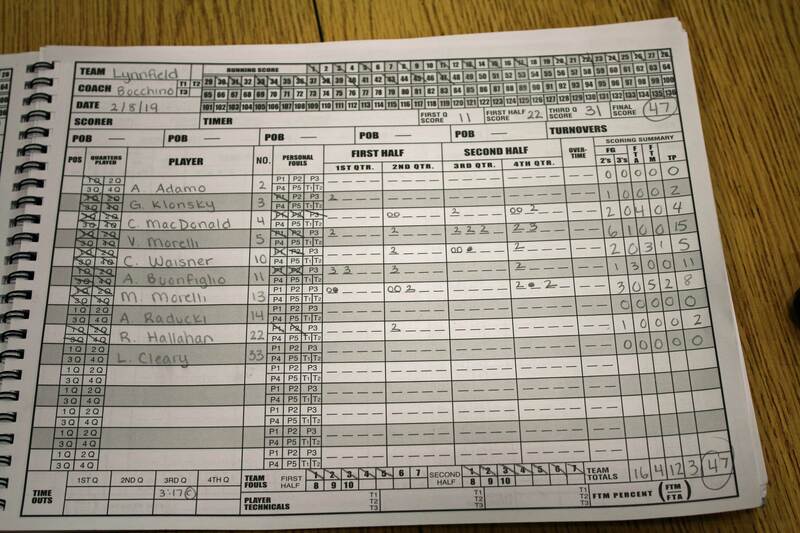 Ezra Mendoza, Gavyn Hillier (14 points), and Austin Matus put points together and knotted the score at 30-30. 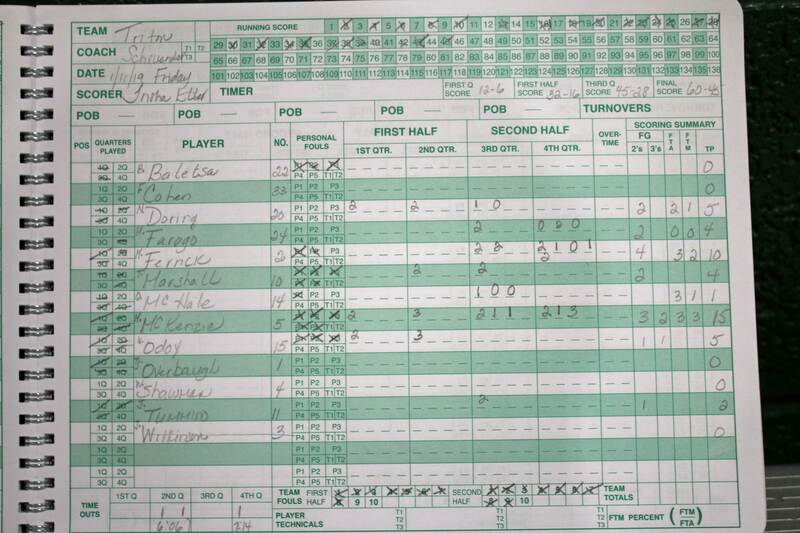 Rockport used a 1-3-1 zone defense and kept Triton away from layups. Triton passed and dribbled their way into open looks but couldn’t make shots. 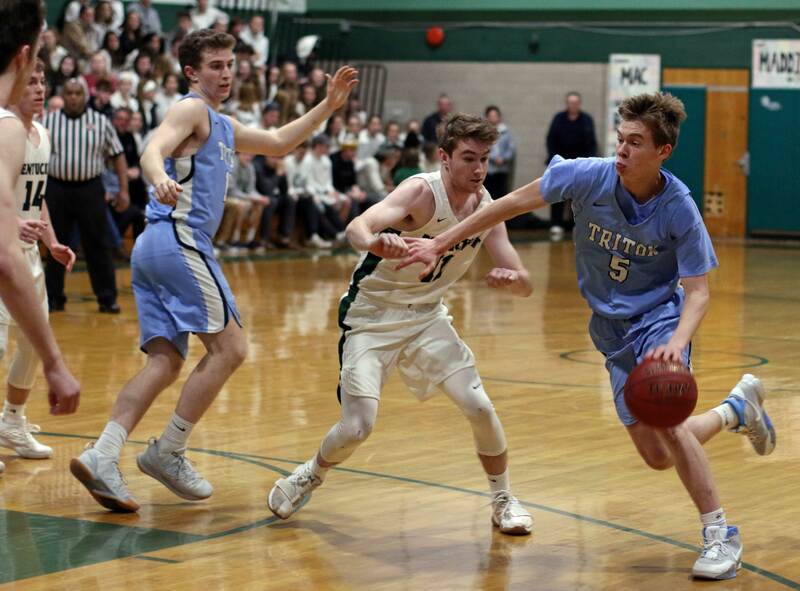 Triton’s man-to-man kept Rockport from doing much damage in close. 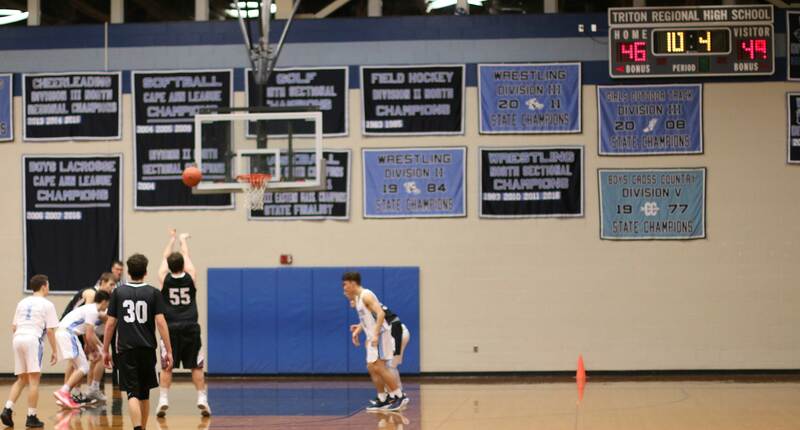 A few times 6-7 Jake Knowlton was able to get the ball inside and finish. 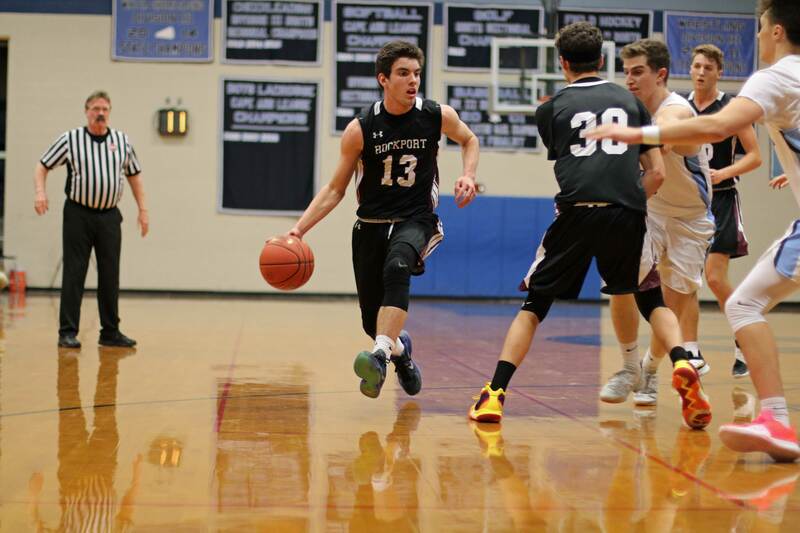 Max McKenzie took the ball to the basket even against the Rockport zone. He was also a key defender. 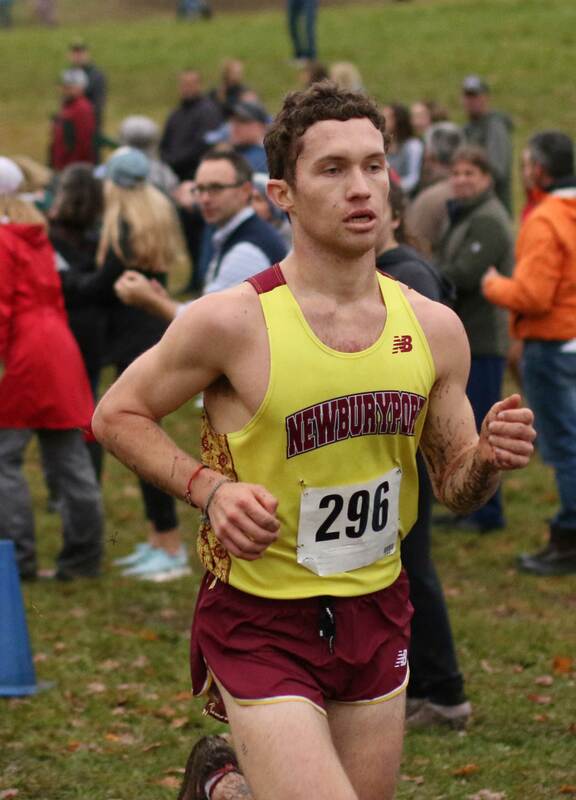 (Amesbury MA) The Newburyport Clippers had a big day at Woodsom Farm taking the Cape Ann League cross country titles in the boys and girls division. 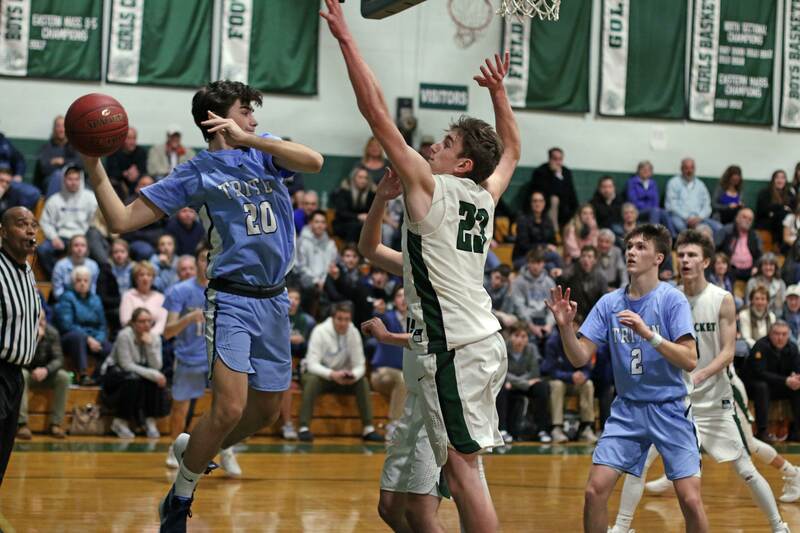 Led by Sam Acquaviva and John Lucey, the Clippers added the CAL championship to their undefeated regular season. 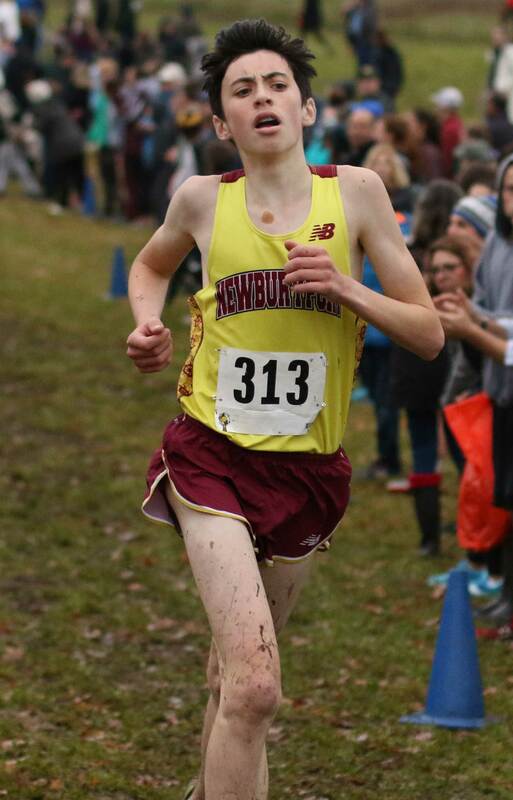 Newburyport won the race by forty points: (1) Sam Acquaviva, (2) John Lucey, (6) Dreese Fadil, (9) Cam Lasson, (17) Peter King. 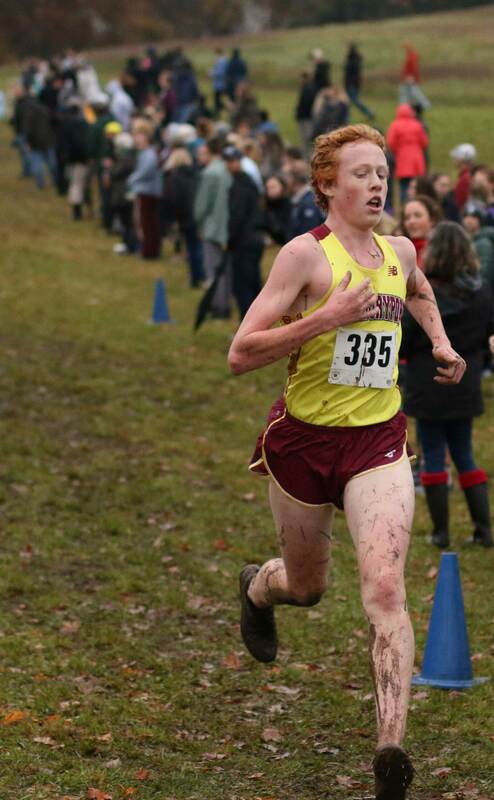 Other top ten finishers: (3) Tyler Stranc, (4) Peter Lopata, (5) Sebastian Gilligan, (7) Will Kenny, (8) John Astrofsky, (10) Keegan Ritchie. 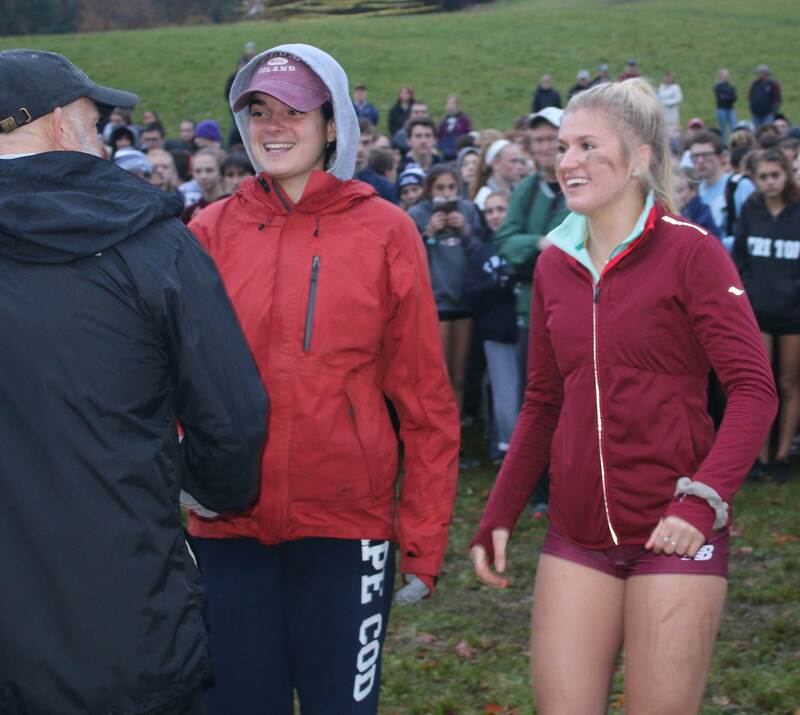 The totals in the girls’ race were much closer: Newburyport (68), Triton (76), Hamilton-Wenham (80). 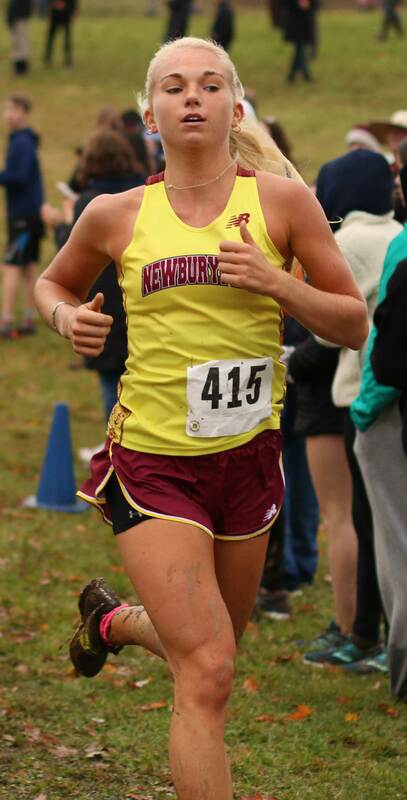 The point scorers for Newburyport were; Ellie Schulson (4th), Lindsey Roberts (7th), Lucy Gagnon (14th), Olivia D’Ambrosio (20th), Caroline Wilson (23rd). 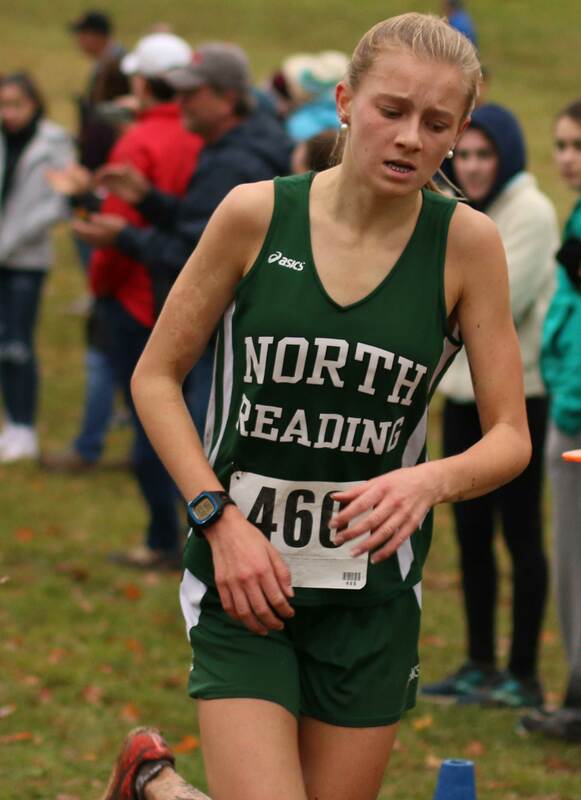 Junior Lindsay MacLellan of North Reading was the upset winner. 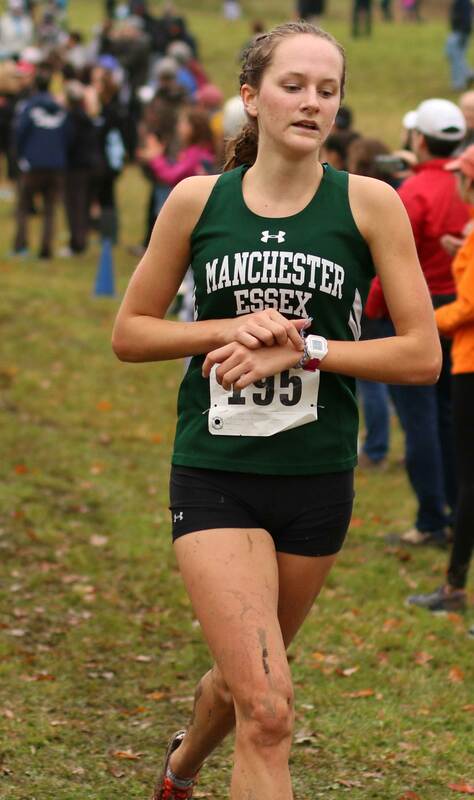 Last year’s winner, Eva Feuerbach of Manchester-Essex, finished second. 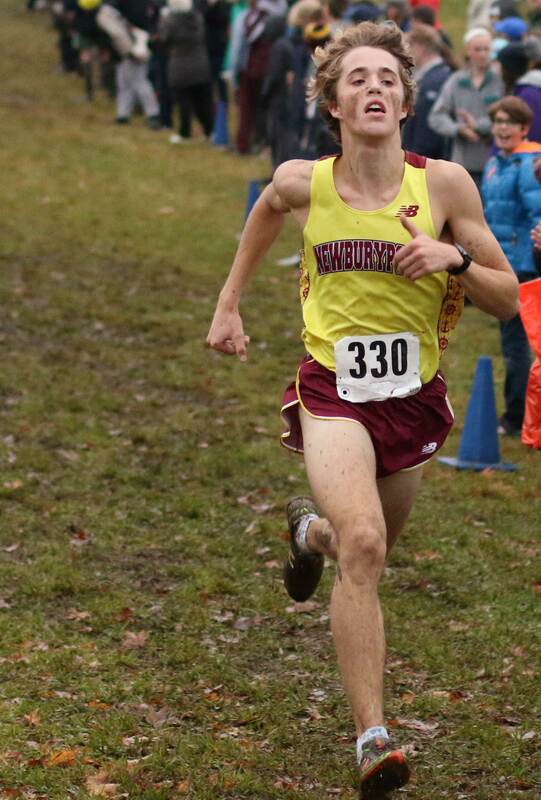 The win by Newburyport avenged a meet loss they had to Triton during the regular season. 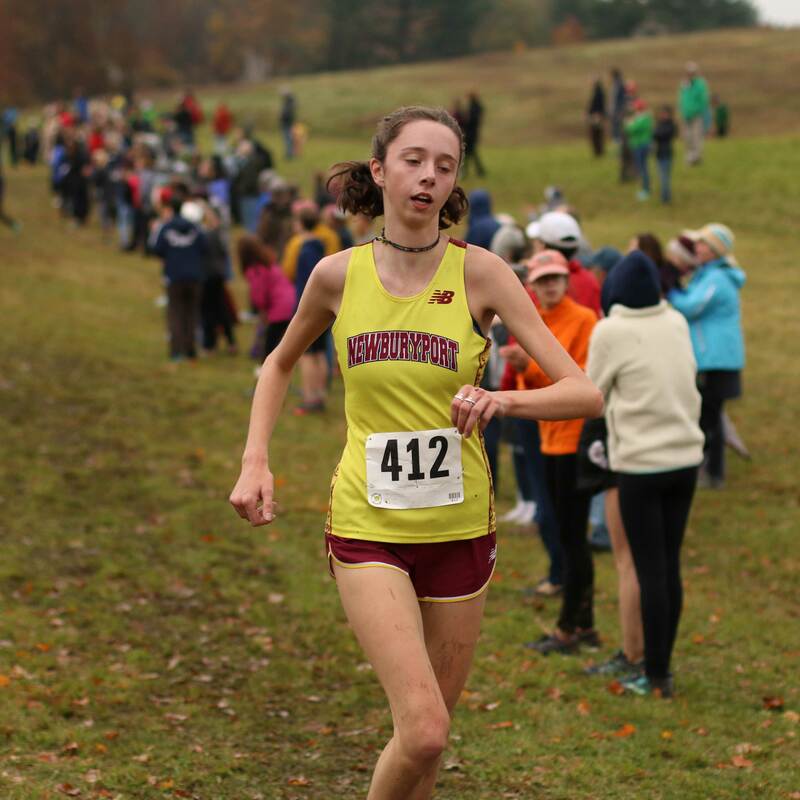 Other top ten finishers; (3) Ellie Gay-Killeen, (5) Phoebe Rubio, (6) Lana Crosson, (8) Ava Cote, (9) Jemma Shea, (10) Sarah Harrington. 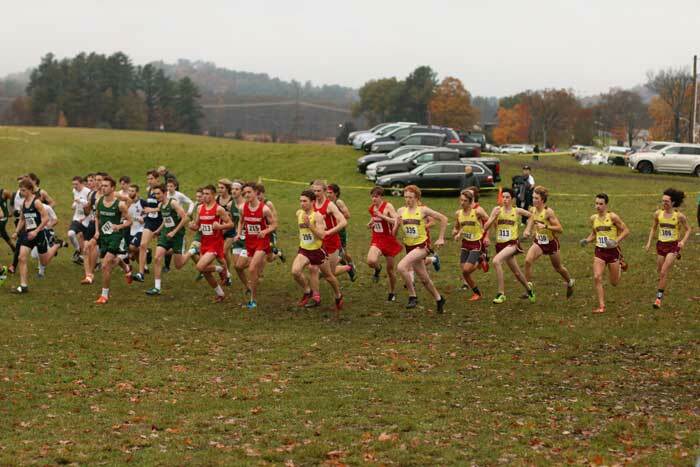 The race was held at Woodsom Farm in Amesbury. Originally scheduled for Saturday at Bradley Palmer State Park but the weather forced a change. The weather actually wasn’t all that great at Woodsom today. 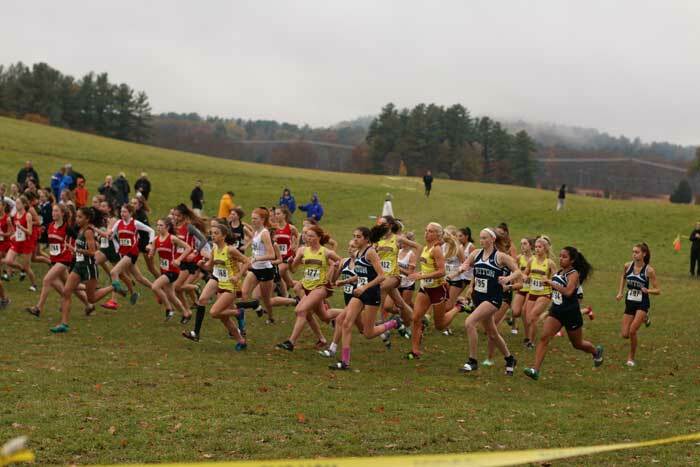 Excellent job done by Amesbury AD Glenn Gearin and his staff handling the parking and other logistical issues. 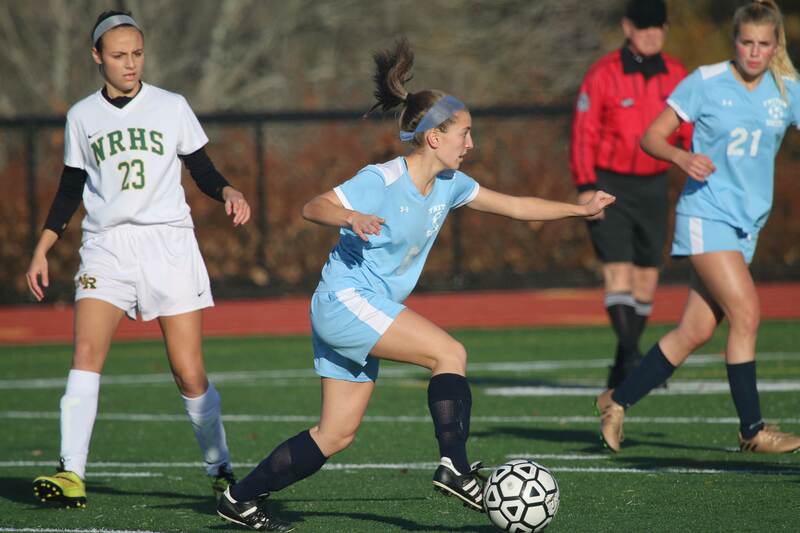 (Byfield MA) North Reading (4-9-4) and Triton (5-11-1) ended in a 1-1 tie this afternoon in Cape Ann League girls soccer. Not a win, but in a season with few of them for both teams, the ending was better than it might have been. The Vikings entered the game having lost seven straight. The Hornets nearly pulled this one out in the final three minutes. 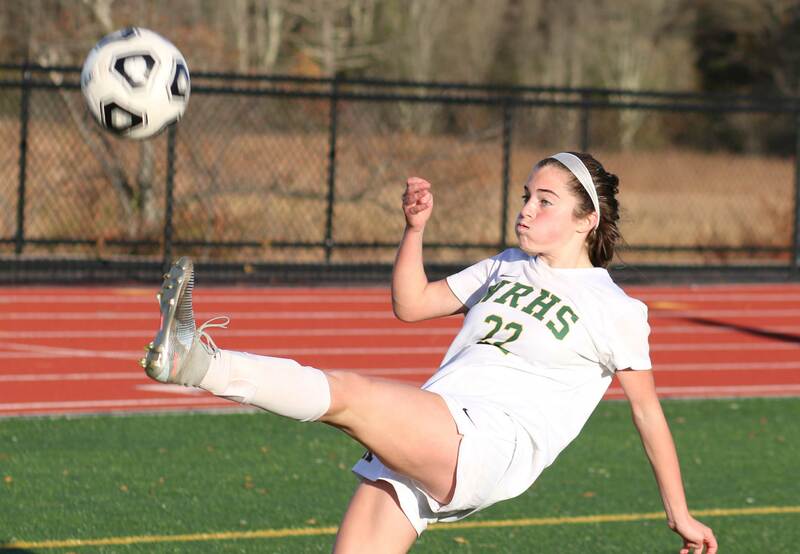 “We had some good chances at the end,” said North Reading coach Sean Killeen afterwards. 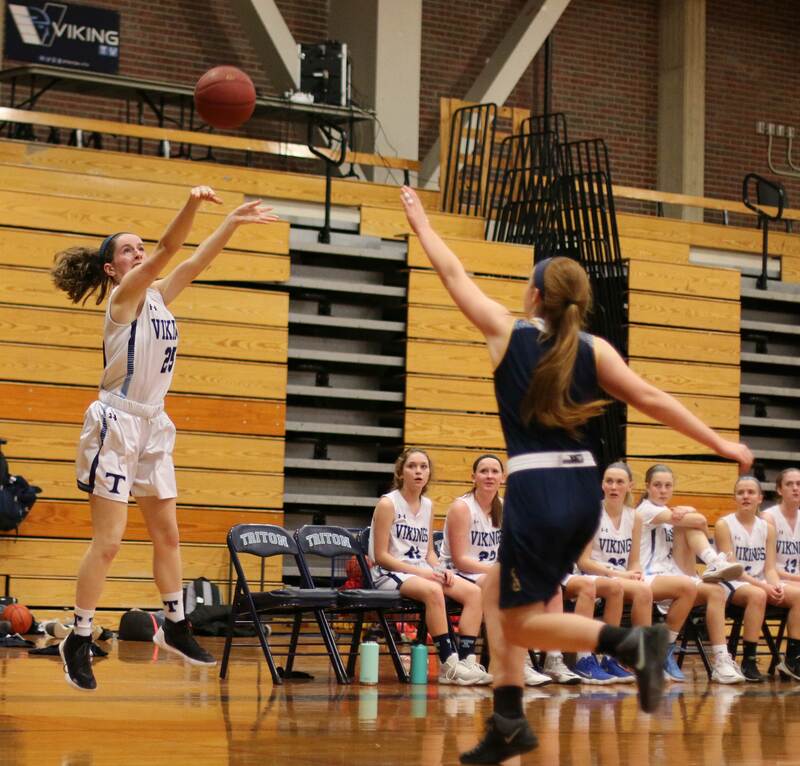 In that high-opportunity final minutes a brilliant rush by Hornets freshman Madison DiNapoli was only thwarted because of an even better defensive effort by Vikings senior Bella Lesinski. Bella was able to stay with Madison as she raced down the middle and force a shot that was barely wide right. That dangerous play was followed immediately by another scoring chance on a corner kick. 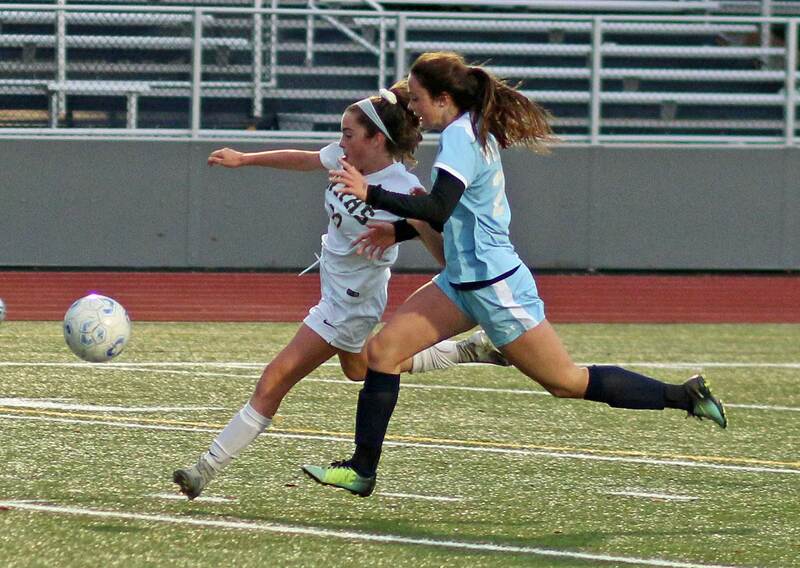 Alyssa Prusik took it and sent it in the middle where Triton’s Bella Lesinski stepped up and drove the ball back with a header. 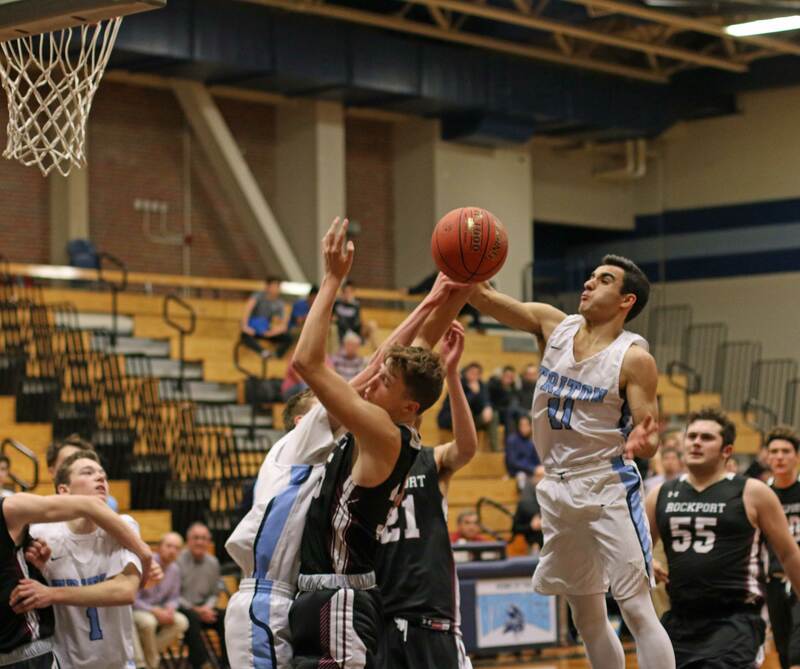 Triton cleared the ball toward the other end, but it was only there momentarily. Back came the Hornets and this time they were awarded a direct kick from straightaway in the closing seconds. 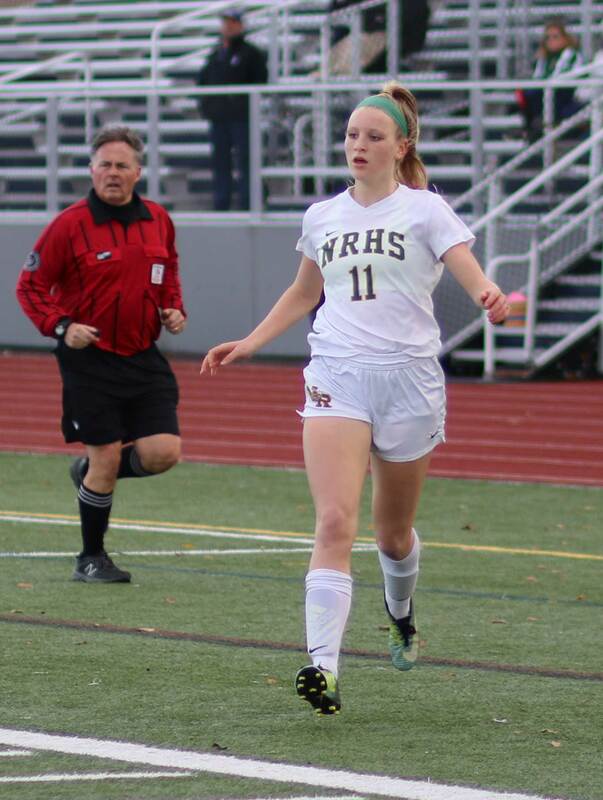 Junior Joanna Kellogg took the kick but sent it wide left as the final whistle sounded. Not surprisingly, Triton was happy at the end (they survived) and North Reading a bit frustrated (they had serious late-game chances). But in the bigger scheme of things, neither team lost. The Hornets started the game with the sun in their eyes and the wind at Triton’s back. The home team cashed in three minutes into the game. 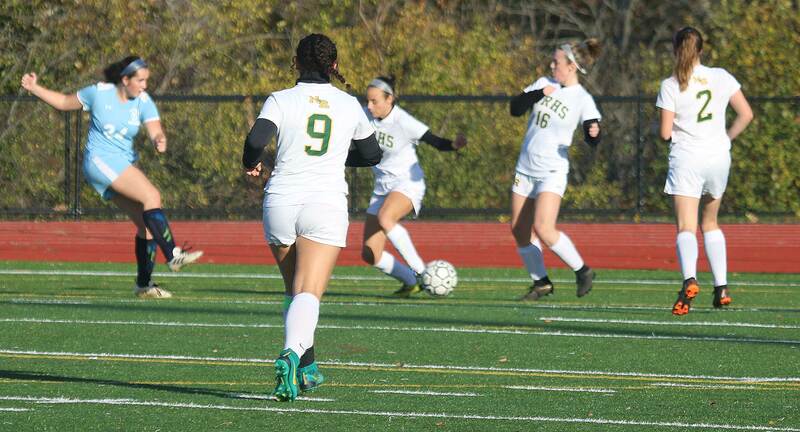 “We’ve been working on getting our crosses better,” explained Triton first-year coach Dave Ducharme after the game. 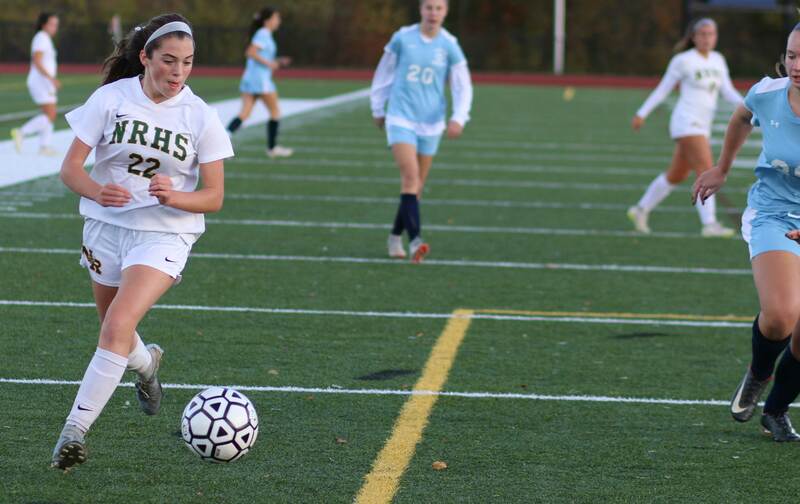 Sophomore Kyla Prussman served a textbook cross from the right. “Elisabeth (Lindholm) collected it and got a good angle to score,” added Coach Ducharme. Twenty minutes later in was North Reading’s turn to execute a well-placed crossing pass. Madison DiNapoli was the passer, after a strong run down the right side. 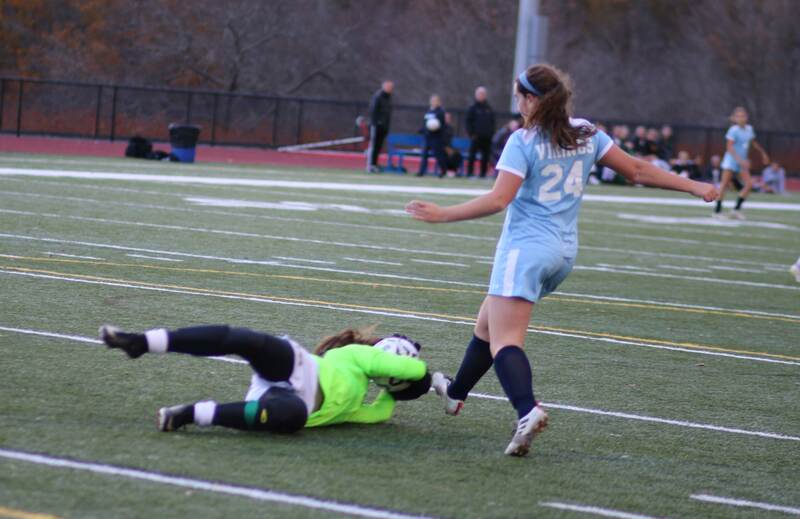 Madison’s pass was far enough out from the goal that Triton keeper Darcie McDonough couldn’t intercept it. 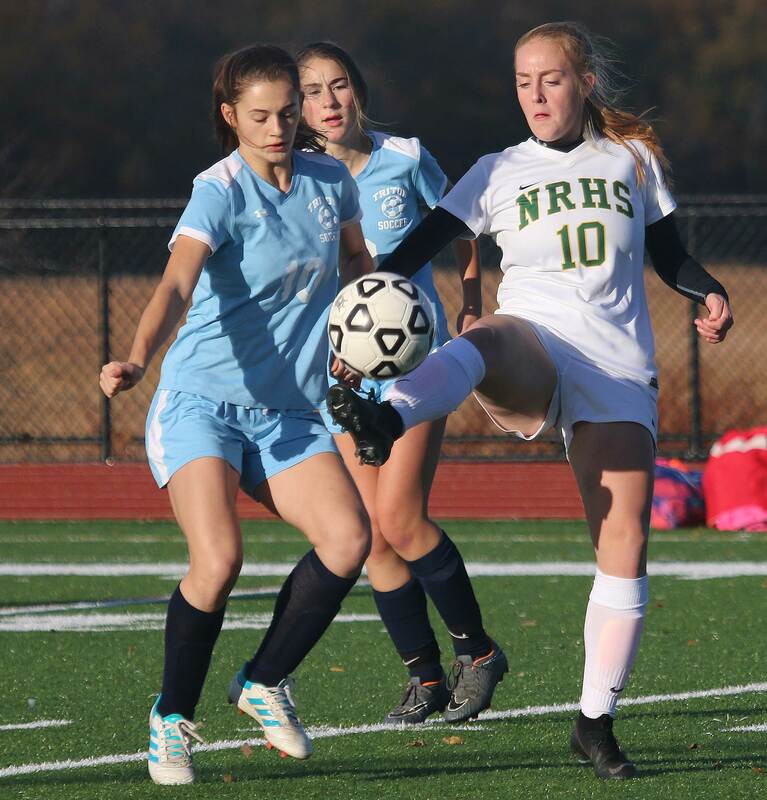 NR sophomore Katelyn Gorgenyi was where the ball was headed but before it got to her it was deflected accidentally by Triton defender Haley Morland into the net. The final fifty-seven minutes of play largely avoided the goal-scoring areas until that exciting final three minutes in the Triton end. 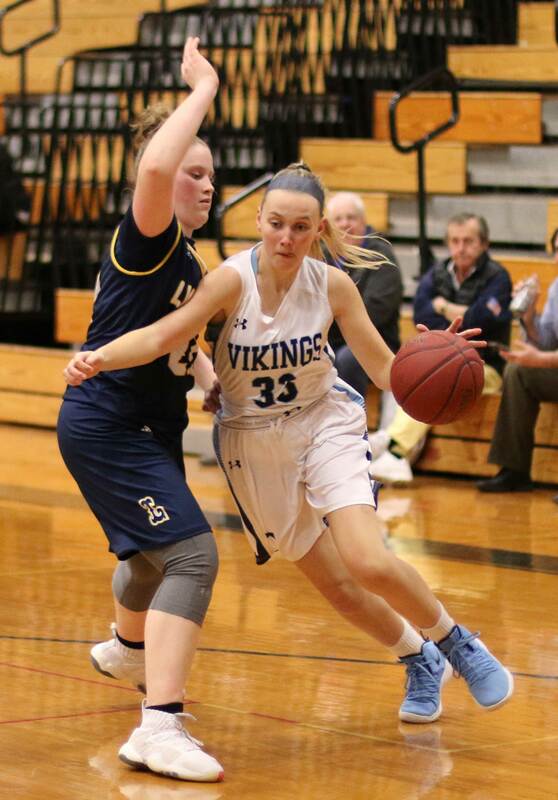 Senior Bella Lesinski (CAL All-Star last year) saved the day for the Vikes in the final minutes. 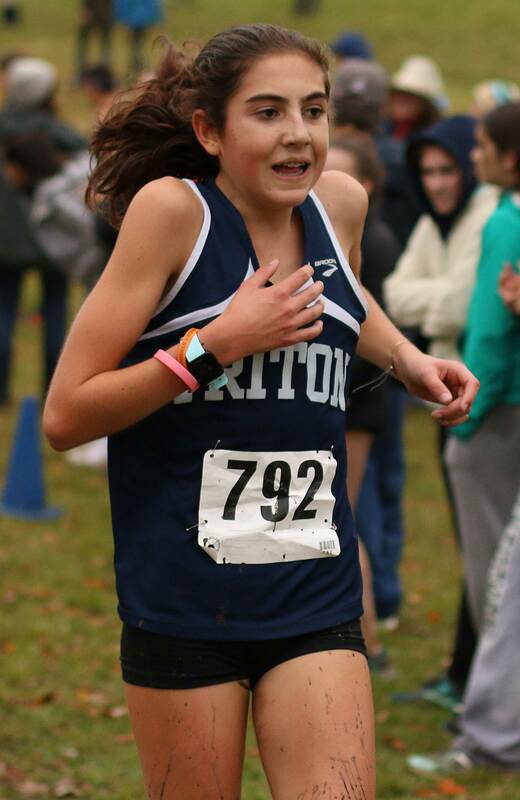 I was impressed with Triton freshman Morgan Hall. Not tall, but a very skillful dribbler and passer. 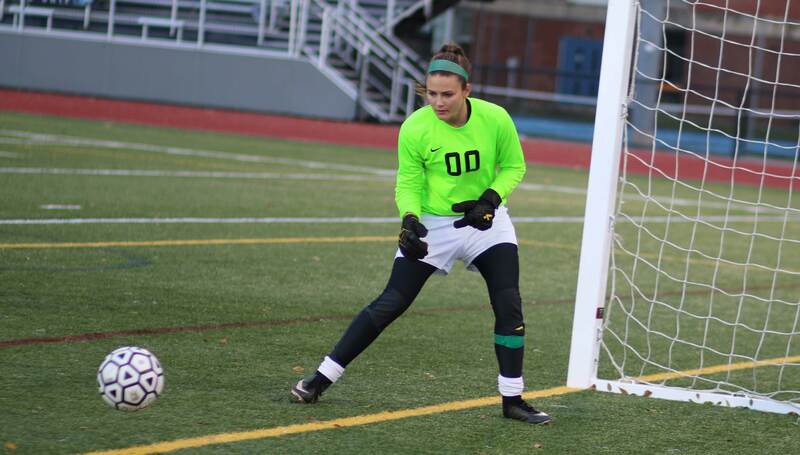 “Morgan has rarely been out of any games we’ve had this season,” said Coach Ducharme. In the first meeting of the two teams (September 21st) Triton was the winner 1-0. 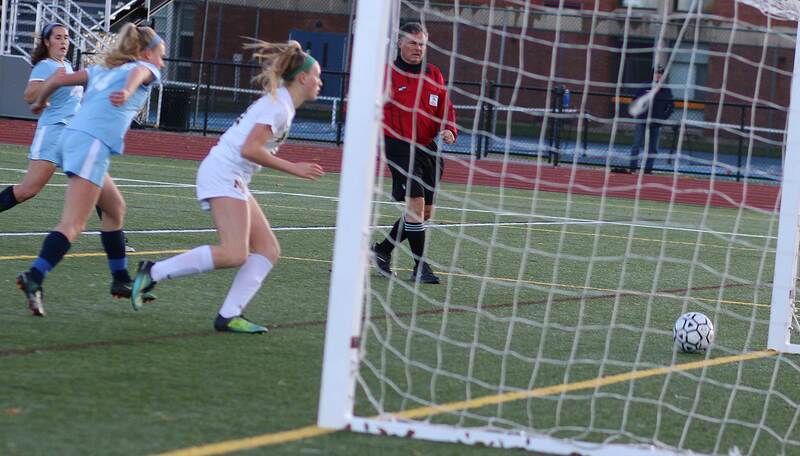 Morgan had the goal in that one assisted by Emily Colby. 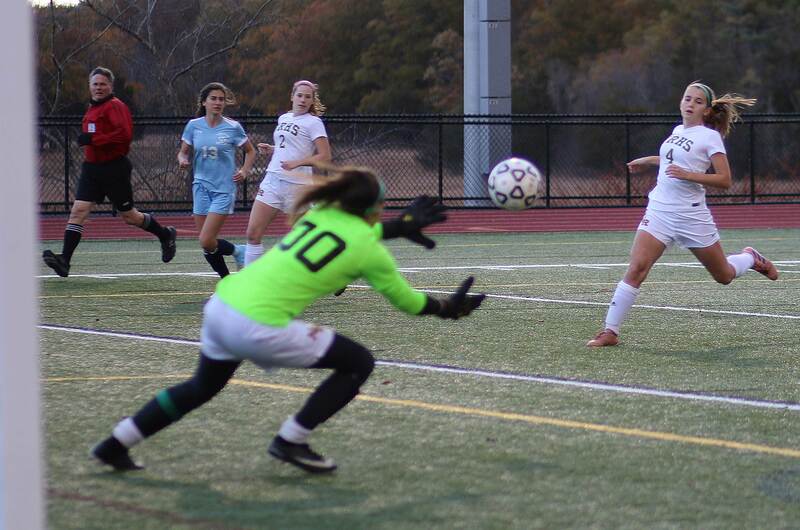 North Reading had qualified for the post-season five straight seasons before this year. 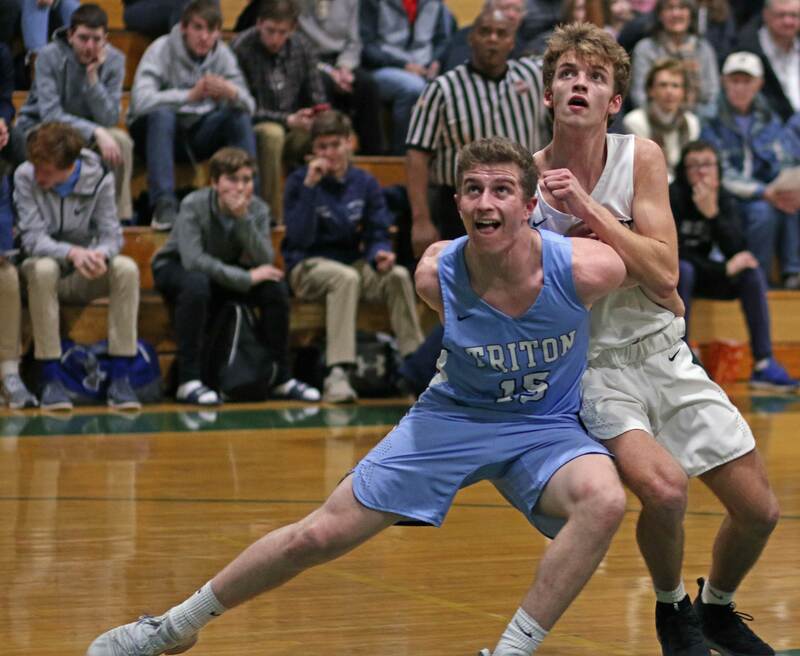 Triton won as many games this year (5) as they totaled over the past two seasons. Their last winning season was the 14-7-2 one they had in 2014. Very impressed with Triton’s turf field. Their lights are excellent too. I’m guessing that a lot of attendees were a bit groggy after witnessing yet another World Series title become a reality late last night. (Byfield MA) I tell you, it’s that senior night thing! Once again, the celebrating team (Triton in this case) falls short and the visitor (Wilmington) is celebrating when the match ends. 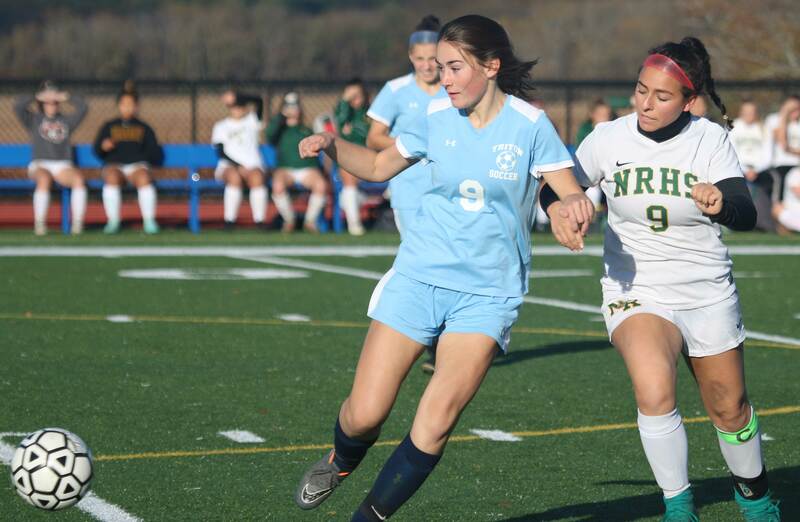 In a rematch, Wilmington escaped with a 3-2 win on Wednesday night in non-league play. The Vikings (4-14) had been shut down 3-0 in the previous meeting with the Wildcats (7-12). 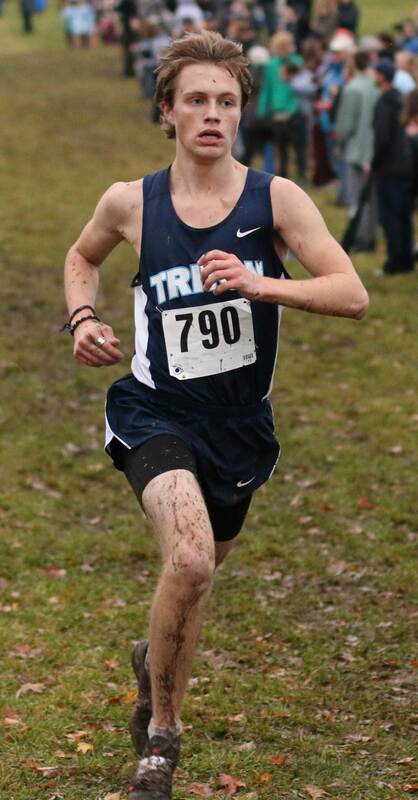 This time around Triton was more of a challenge to Wilmington, although it didn’t start out that way. The team from the Middlesex League rallied late to sweep the first two sets, 25-22 and 25-20. Looked like a short night for the Cape Ann League entry. But not this time. The Vikings pulled away from an 18-18 tie to take the third set and then dominated the 4th set 25-16. That momentum continued into the last set for Triton. They started out 9-6 and looked to be heading for a very happy ending. 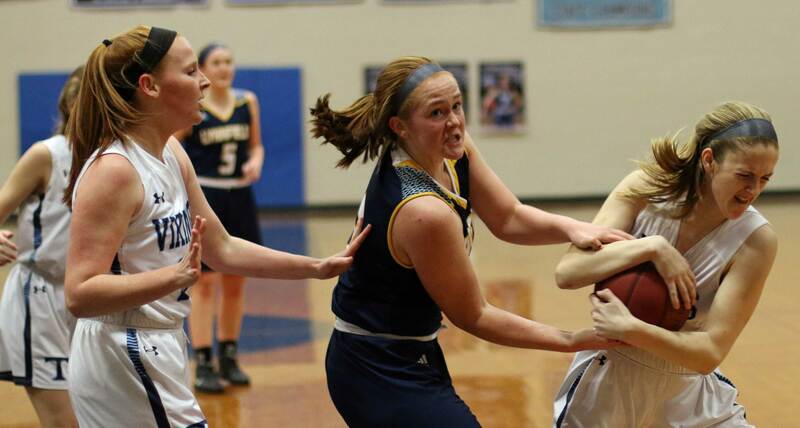 Led by server Anna Rideout, the Wildcats rolled off seven unanswered points to go up 13-9. Triton put a stop to the run briefly, but the Wildcats finished strong to win 15-11. 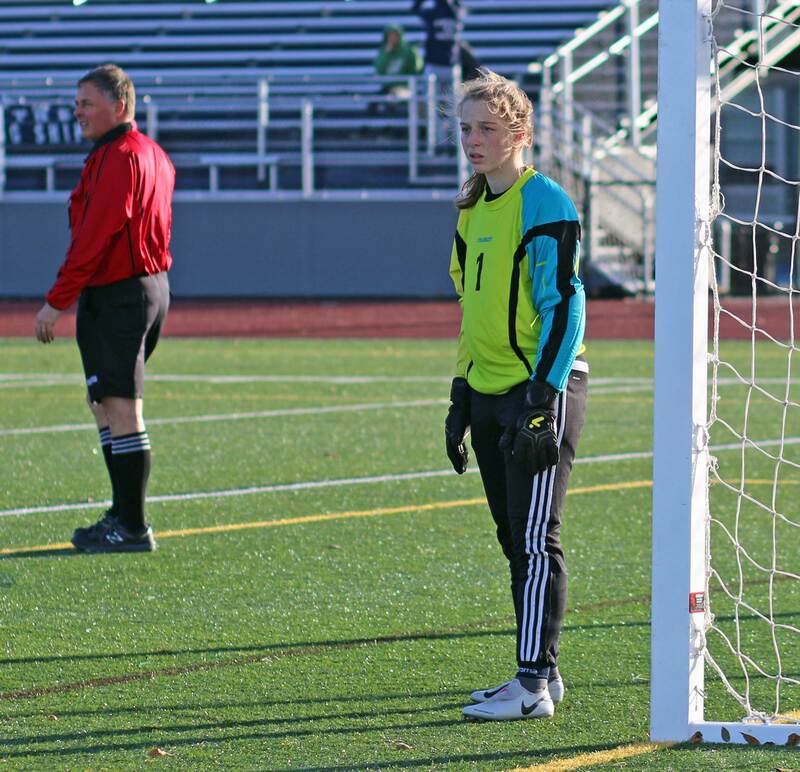 “We were determined not to lose that last game,” Wildcats Gabby Bond told me after the match. 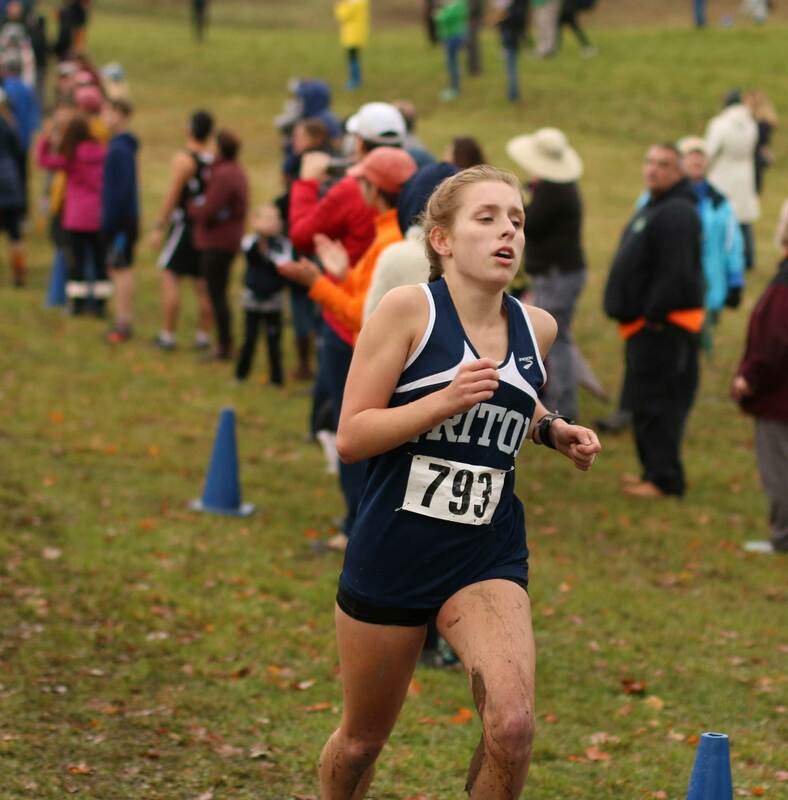 The Wilmington senior is hoping to go to UConn next year and train to be a physician’s assistant. Triton honored four seniors before the game; Colleen McCarthy, Caitie Rooney, Savannah Nolan, and Molly McInnis. Savannah had a strong game for the Vikings on the front line. The hardest replacement? “Caitie Rooney, she’s an awesome setter.” Caitie was a Cape Ann League All-Star last year. Both Britt and teammate Maeve Cadogan were excellent at serving. This is only Triton’s fifth season having volleyball. Their best season so far was 2015 when they went 5-11. Neither team tonight had devastating hitters. That forced longer volleys and more excitement in my opinion. The Wildcats were 9-11 last season. 2004 was the most recent season that they qualified for the post season. I will not attempt to dazzle you with any stats since I didn’t pick any up after the game. 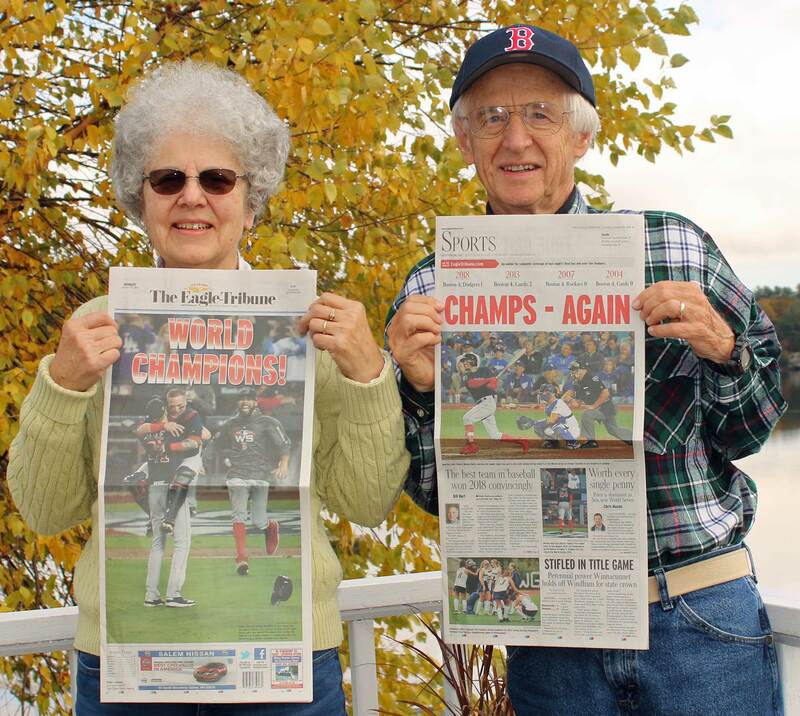 Congratulations to the Red Sox for the Game 2 win. I will never learn that watching a game on TV and writing up a game at the same time, limits both activities!